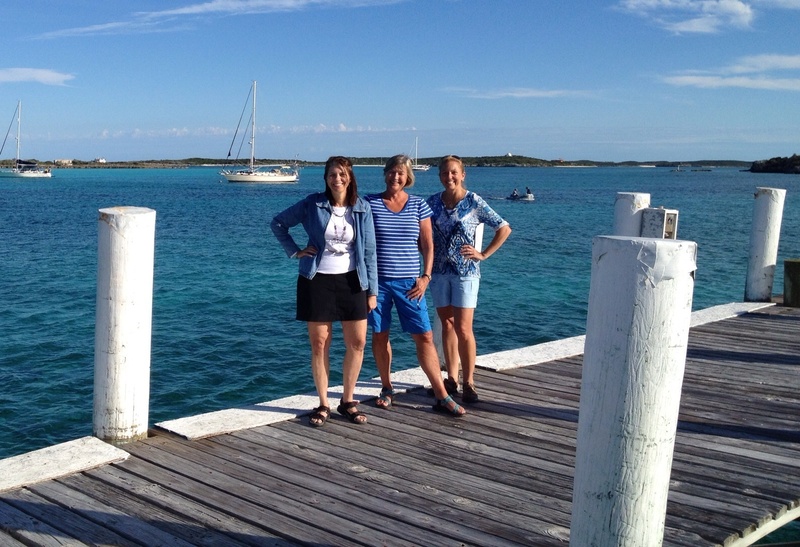 We left the Exuma Land and Sea Park for places further south. 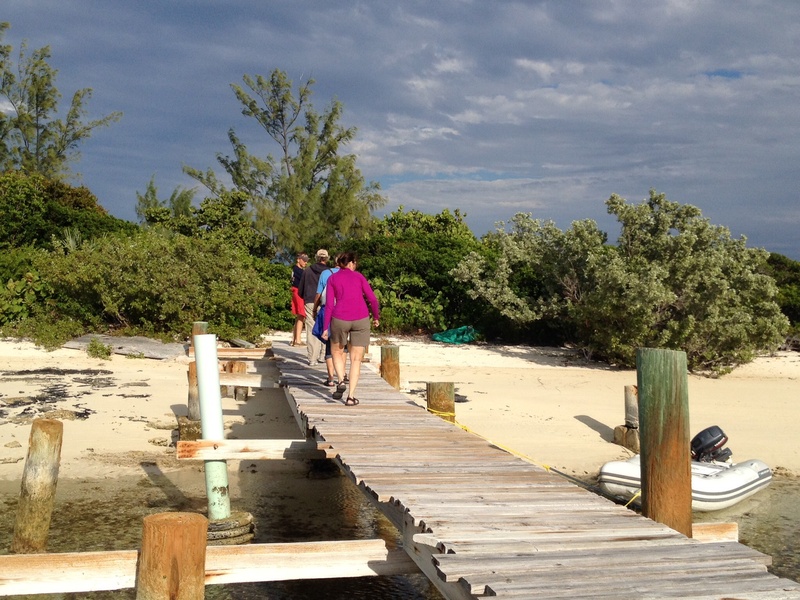 Next stops: Staniel Cay, Black Point Settlement and Little Farmers Cay. 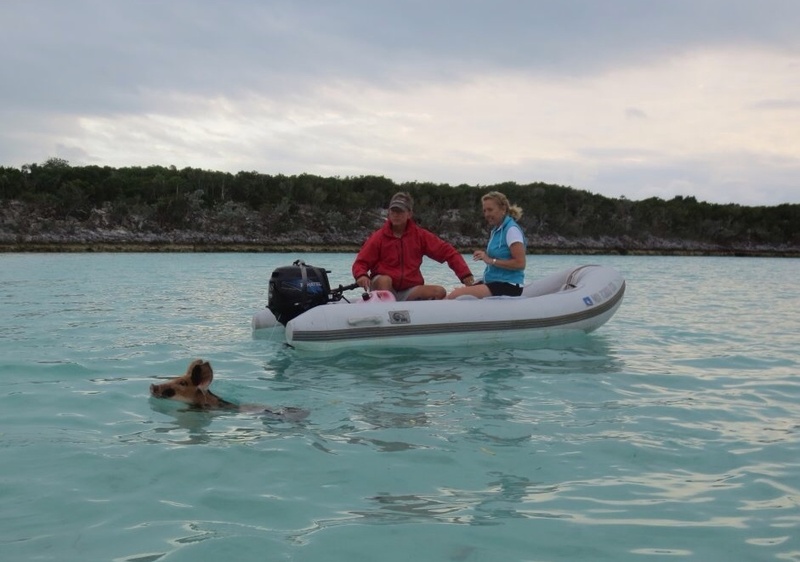 Staniel Cay is particularly famous for wild swimming pigs. 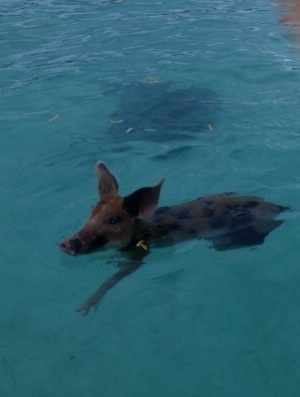 Yes, you read that right: wild, swimming pigs. 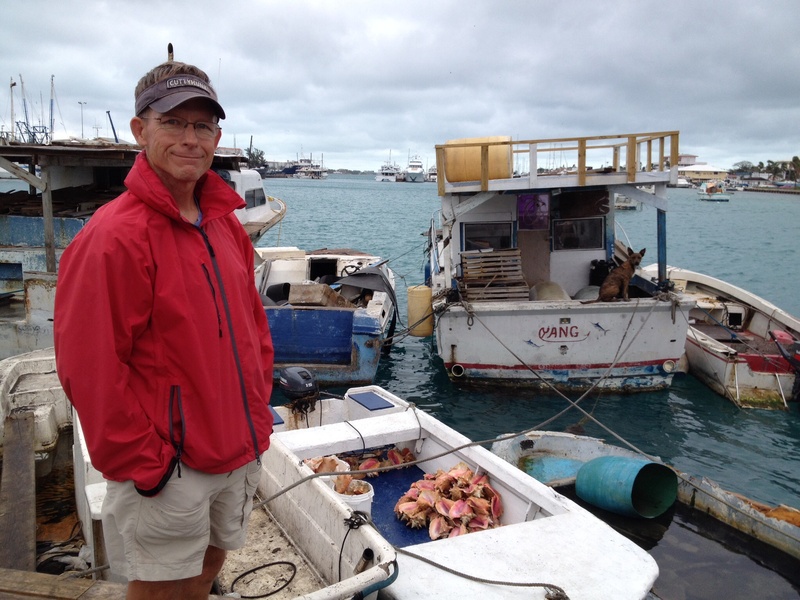 We were anchored around the corner from the harbor at Big Major Spot. Yes, you read that right, Big Major Spot. Funny name. Our stay there was brief but enjoyable. 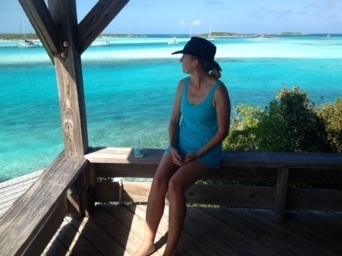 We took the dinghy in to visit Staniel Cay “proper.” After being at the park for nearly a week with nothing around but nature (which we loved) it was actually nice to go to a place with a little restaurant on the water where we could get a sandwich and a couple of Kaliks. However, to get from the dinghy to the dock, we had to climb a ladder over a ray and a large shark. Yes, you read that right. It was a nurse shark, which everyone tells me is the friendly kind . . . uh huh . 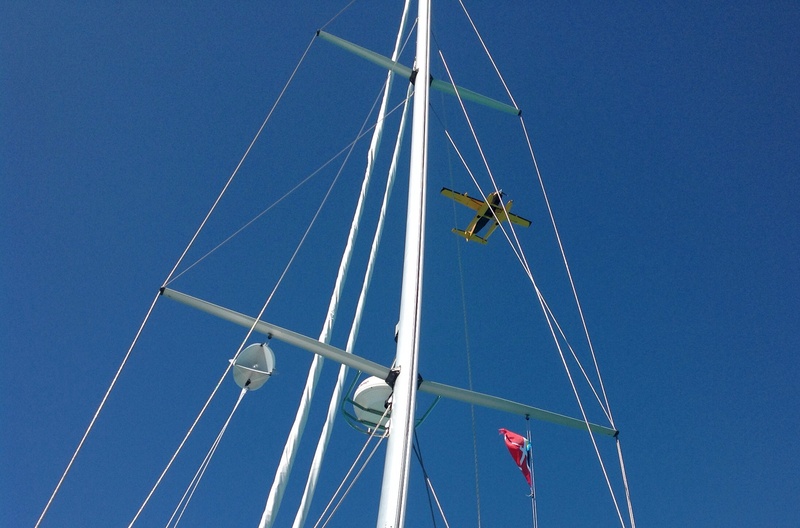 . . but he/she was quite large and proceeded to park itself right under the dinghy which made climbing the fives step ladder to get on and off the dock just a little more exciting. Apparently, people feed the sharks and the rays at the marina and they are quite tame – at least that’s what I kept telling myself. We walked around town, took advantage of a couple of small grocery stores, talked with some lovely ladies who ran each of the shops, and enjoyed stretching our legs. As we discussed which day of the week the mail boat comes in (a BIG day for each location since it brings in all shipments and supplies including the fresh produce for restaurants and grocery stores and is the lifeline for any business) the one woman laughed and said, “They don’t call us ‘out islands’ for nothing!” The islands are pretty small and sparse, but very friendly. On the way back from town, we cruised by the beach where the wild pigs hang out. Apparently many of them were napping, but two little pigs did come out to the water line. Only one was motivated enough to swim out to see what we had for her. We had taken the end of Frank’s lunch with us. Miss Piggy was very interested in the lettuce but totally turned her nose up at the leftover french fries. I figure either she was trying not to make a pig of herself or the potatoes were fried in bacon fat. She was very cute and friendly and we enjoyed her visit. I had seen pictures and heard about the pigs being big and aggressive. A couple of days later friends told us of witnessing a small boat going up to the beach in the very, very shallow water and having several pigs trying to launch themselves onto the boat! I enjoyed our mellower interaction with our little speckled friend. The next day we moved on to Black Point Settlement. We caught it on the day of their community BBQ. They had huge grills fired up making steaks, ribs, chicken and fish. We had a delicious meal there, caught some of the local flavor and then walked around more of the pretty little island. Finally! Ice cream! It is hard to come by in these parts. Anthony and Frank partake happily. 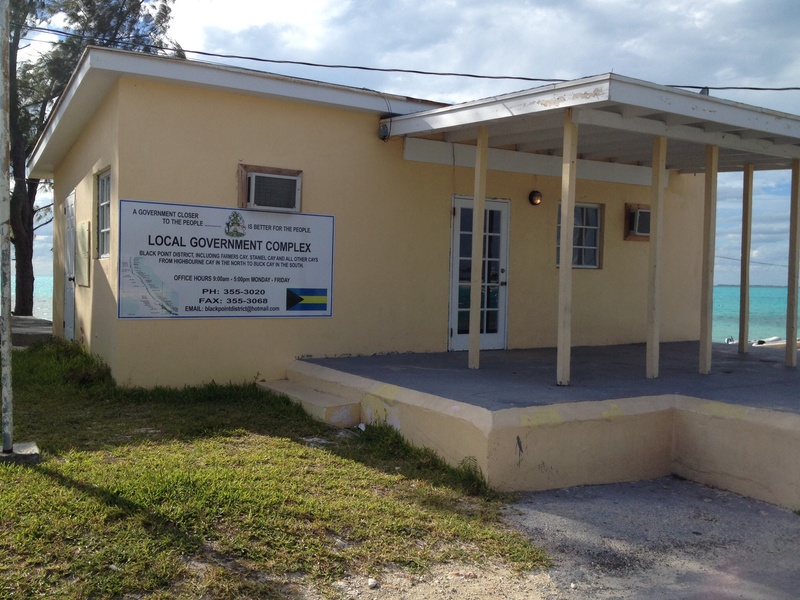 This gives you an idea of the size of the settlement; here’s the government office! 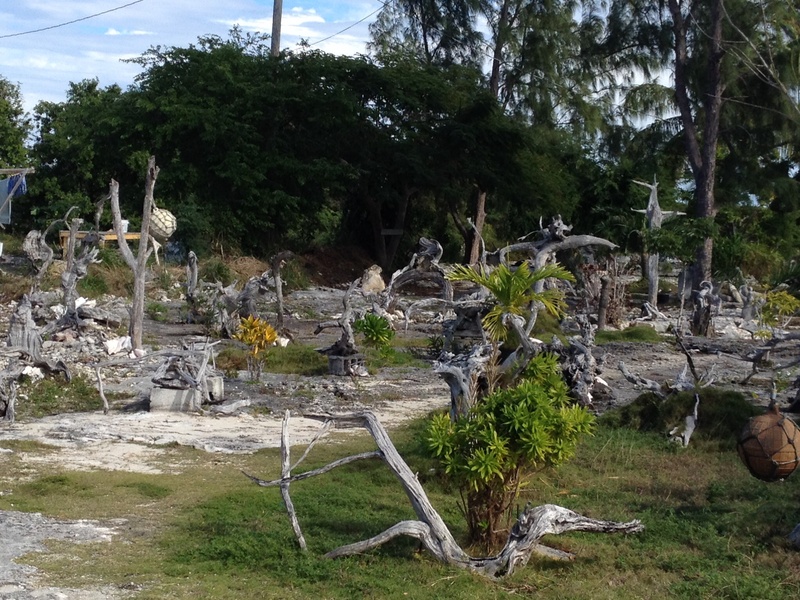 Here’s an interesting display of driftwood in someone’s front yard. A cottage on Black Point. Love this evergreen! Although it might have been nice to stay in Black Point for another day, we kept our visit short because of an approaching front that was predicted to have some pretty snarly west winds. The wind direction is very, very important for where to anchor the boat. Picking the wrong spot can mean a) worrying about the anchor all night because it is rough, and b) getting a bad night’s sleep due to the boat rocking and rolling all night. 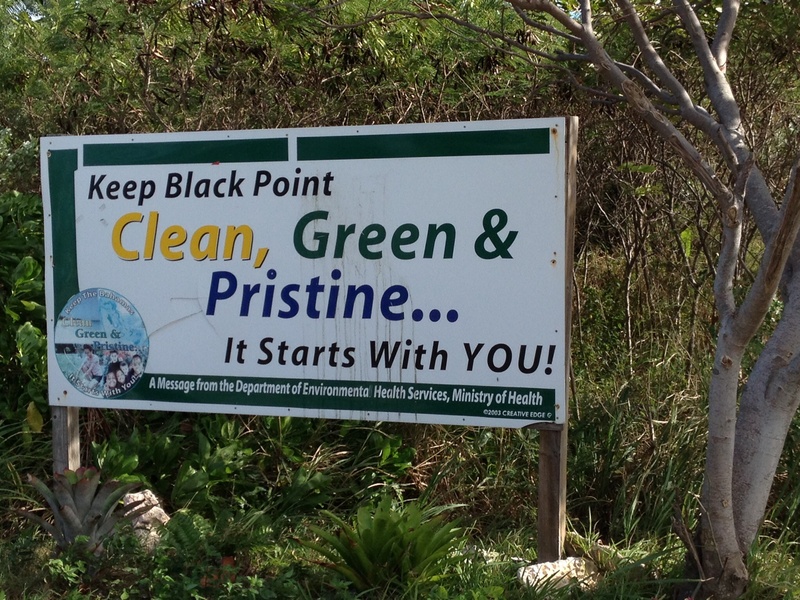 So off we went to find better protection at Little Farmers Cay. The anchorage and mooring field are situated between a couple of land masses, so it is a fairly settled anchorage. There is a big festival in February here, so we were there at a quiet time – which was kind of cool. It felt like we had a private island! And at this point we were back to our fleet of three traveling together. Our first night we rode in to the little harbor and enjoyed dinner at Ocean Cabin. 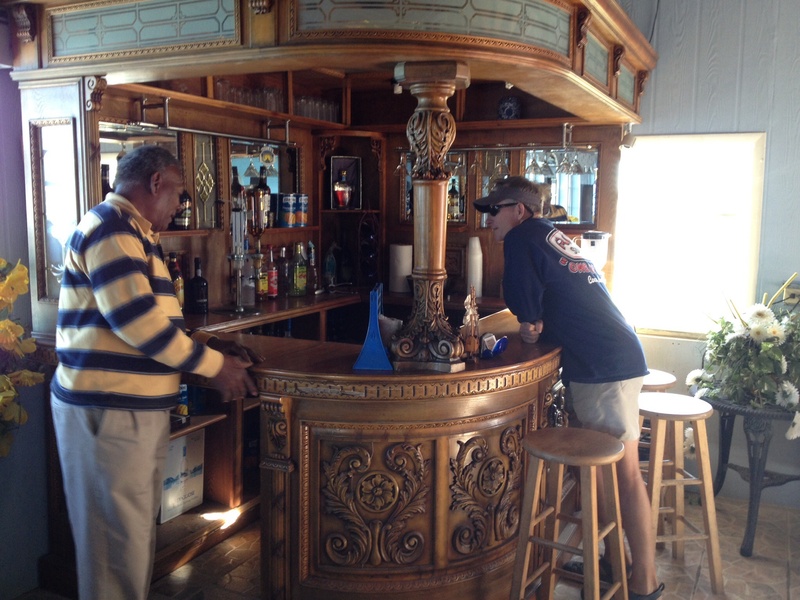 Terry, the proprietor, was an interesting character and his wife was the evening’s chef. We ended up being the only people in the place for dinner! We enjoyed great conversations and Terry joined us for a memorable after dinner chat. 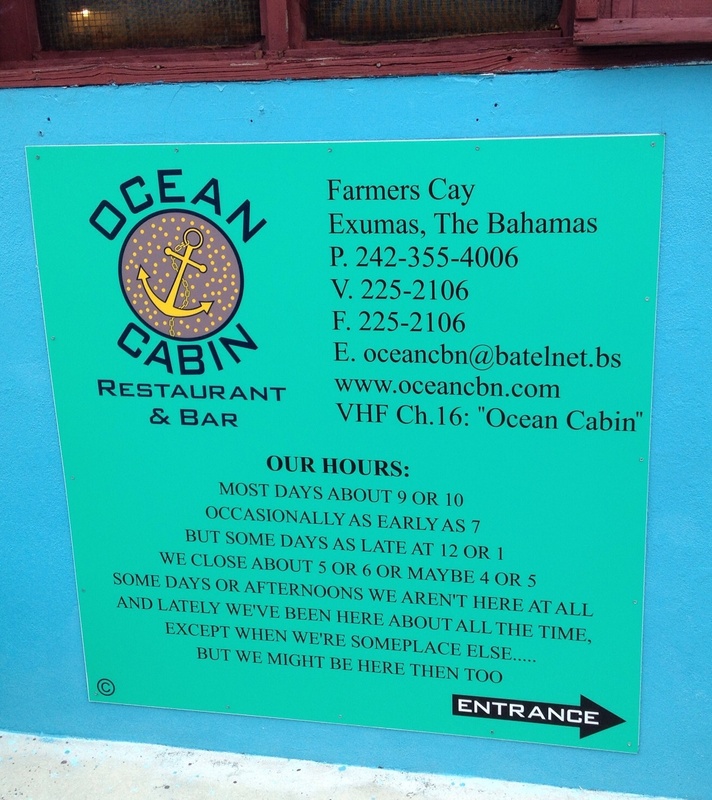 The next day we went back in to the second of two places to get a meal on the island: Farmers Cay Yacht Club. Roosevelt was the owner and our host for the day, and again, we were the only people there! It was a leisurely, mid afternoon meal and we enjoyed walking the docks and enjoying the warmth of the sunshine as our made to order dinners were prepared with love. 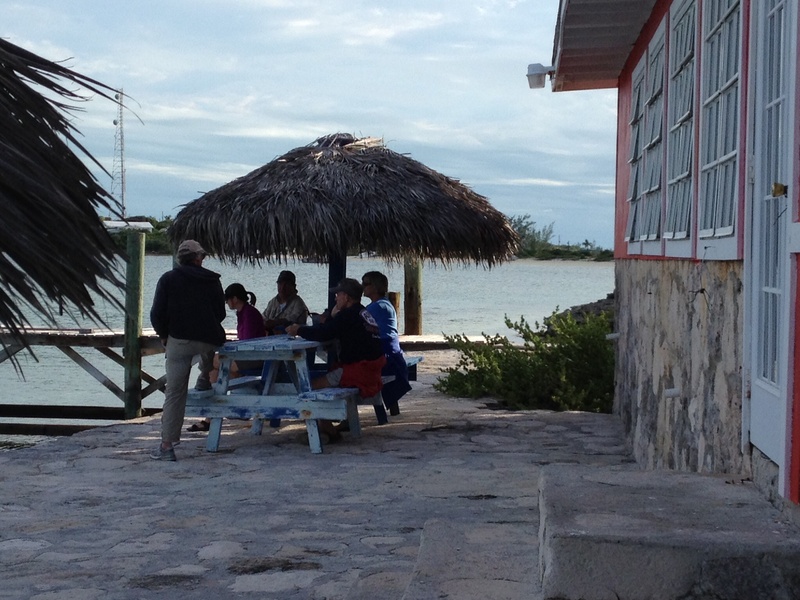 Roosevelt brought our conch fritters out to the dock for us to munch on while we waited for dinner. The wait was well worth it! Roosevelt was a gracious and delightful host. 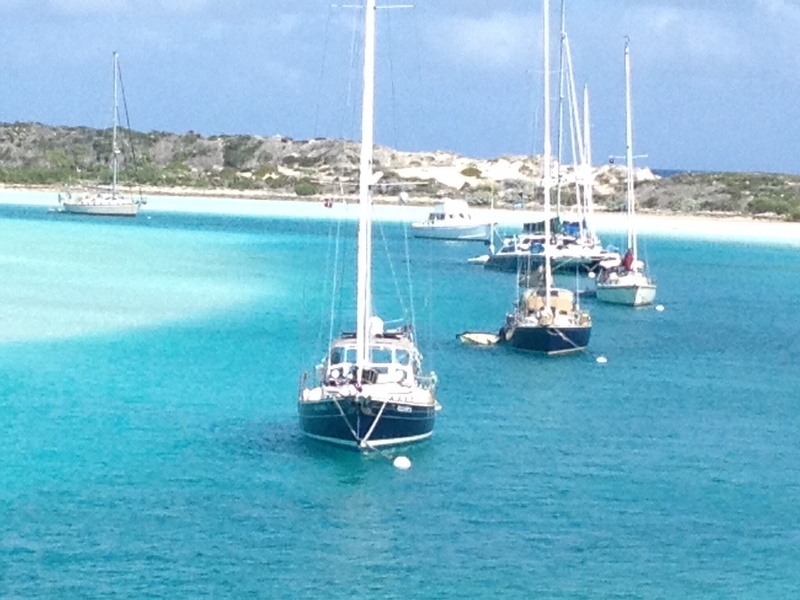 And we enjoyed the view of our boats in the harbor. Little Farmers has the Five F Festival (Farmer’s First Friday in February Festival) at which time 100 – 200 boats could be anchored up there. It was hard to picture after our peaceful, low key, private tour of the area. I think I might like visiting it when it’s quiet better! 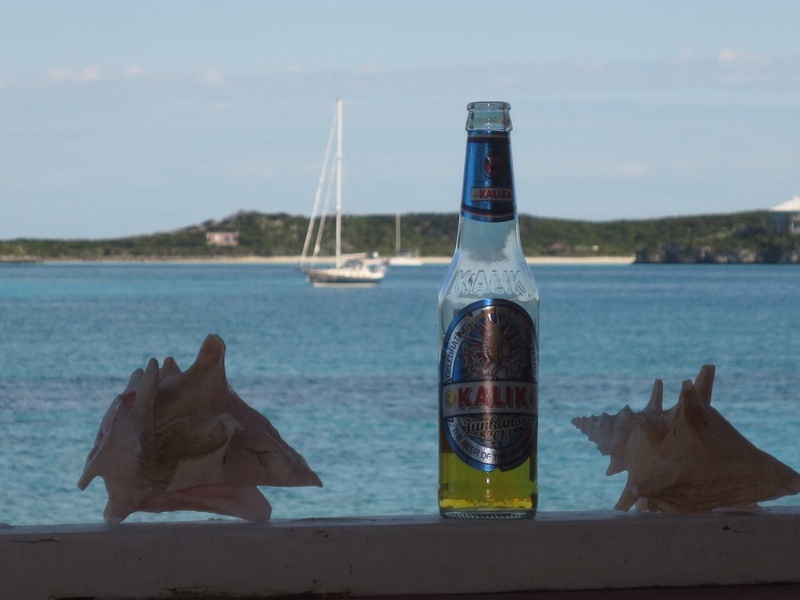 Kind of looks like a Kalik commercial, doesn’t it? Anthony posed this picture with Eleanor Q in the background. Very artistic. 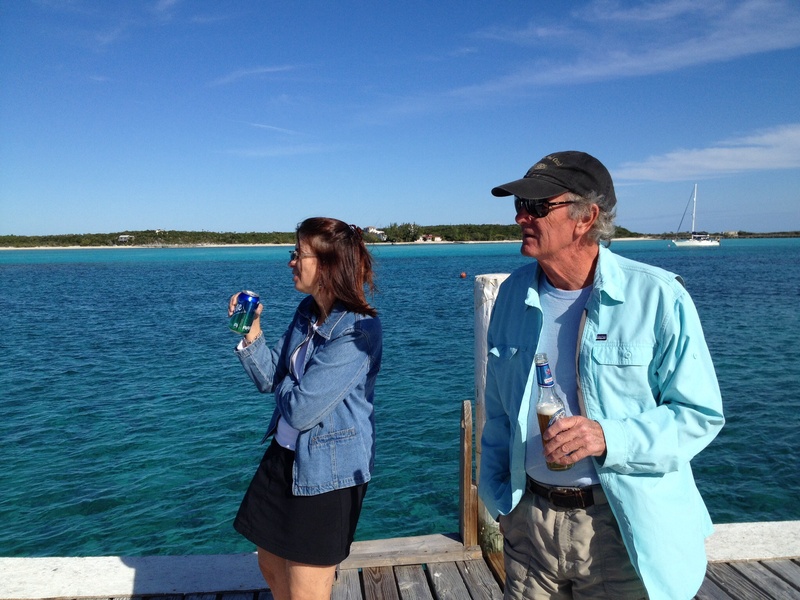 Ron and Annette enjoying the view and the sunshine. See, we had long sleeves on. We had a little chill. We needed the sun! Nope, not getting any sympathy, are we? Don’t Nancy and Frank look like siblings in this picture? After our two days there, it was time to get on down the road to George Town, our planned southernmost point in our travels and a place we had heard and read so much about . . . the key word in that sentence being “planned”. You read that right. Stay tuned to see if that’s where our southernmost point turned out to be or not! A funny thing has happened since this blog was started last spring: it became winter. Posting pictures of water and sailing and swimming during the summer has people saying, “Ah, isn’t that nice.” “Oh, look at that.” So let’s just put this on the table here and now . 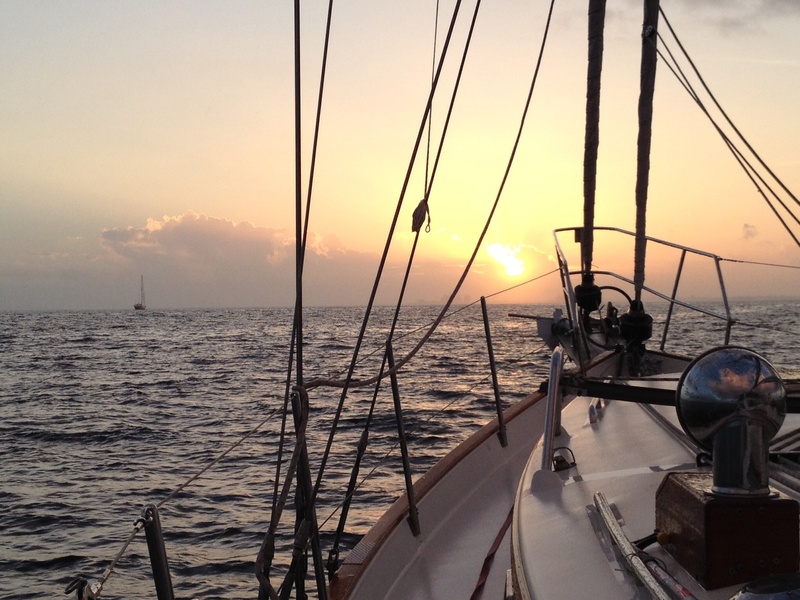 . . you are about to see pictures of blue water and swimming and sailing. And you may be one of the people sitting in a part of the country having record low temperatures and snow, and for that, we are very, very sorry for you. Really – we feel just terrible. So if you’re going to be totally disgusted with us when you see the blue water and snorkeling, then just stop reading now. You have been warned. There are a few pictures thrown in with us wearing jackets, just for good measure. Why, as this is being written, it’s 66 degrees with a wind chill of 62! So it’s not all 80 degrees and sunny, okay. We’re suffering too. We had to put long sleeves on this evening! 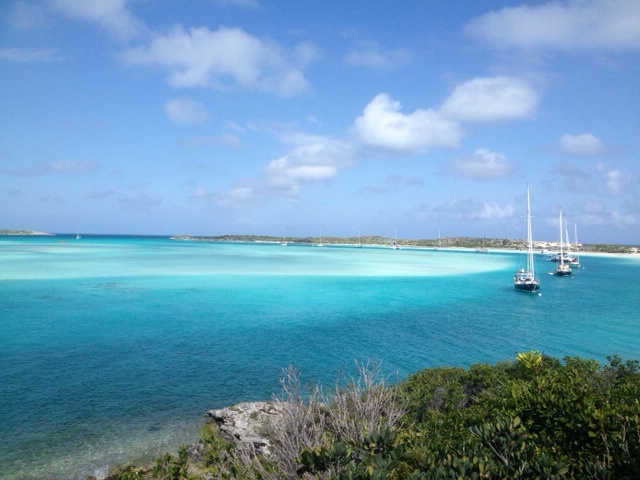 With that out of the way, put the winter aside for a few minutes and come to the Exumas with us. 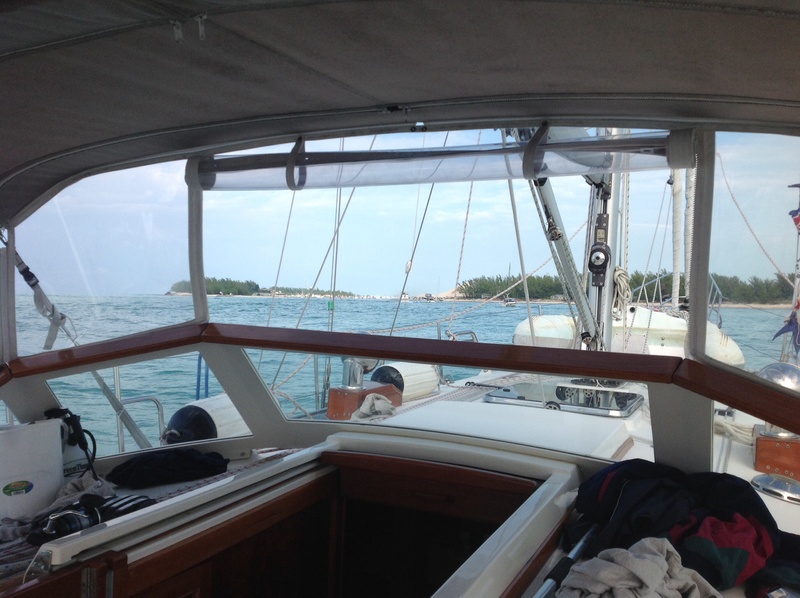 We left Nassau and did the 35ish mile trip to Highborn Cay (pronounced “key”). There was a little wind vs. wave action going on, so there there was a chop to the water and some pretty good sea spray happening over the deck. 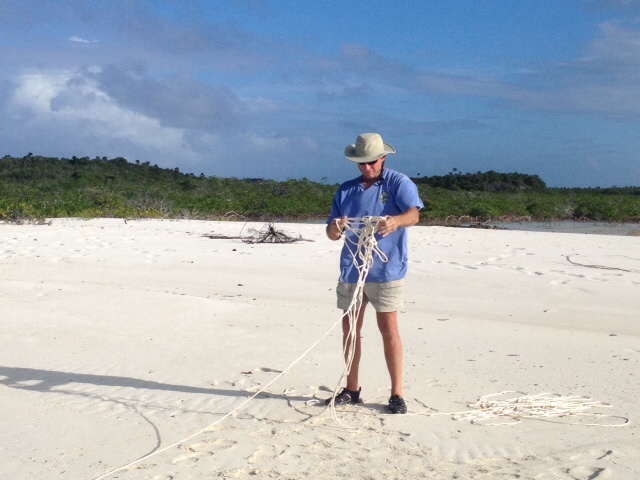 It was also our first day of using “VPR” or Visual Piloting Rules which you need to do a lot through the Bahamas. The note on the chart says, “VPR apply. Good weather, sunlight, bottom reading, and piloting skills required.” In short, that means, “Watch out for the coral reefs.” Watching the color changes in the water is a big clue, and down here the water is SO clear that it is pretty easy to see the changes. Different shades of blue indicate different depths. What took a little getting used to is that, if you can see the darker brown areas that are the coral, it looks like it’s really, really shallow! Very unnerving. We were learning that the coral can be 10 – 15 under your keel and you’re still going to be able to see it in the clear water; it’s only going to FEEL like you’re about to hit it. So one part of our trip to Highborn went across what is called the Yellow Bank where you really do need to have someone perched to watch out for coral heads. Frank on the bow watching for coral heads while Ems is at the helm. Highborn was just an overnight stop, but an important night: we were traveling with Magnolia and it was Anthony’s birthday! 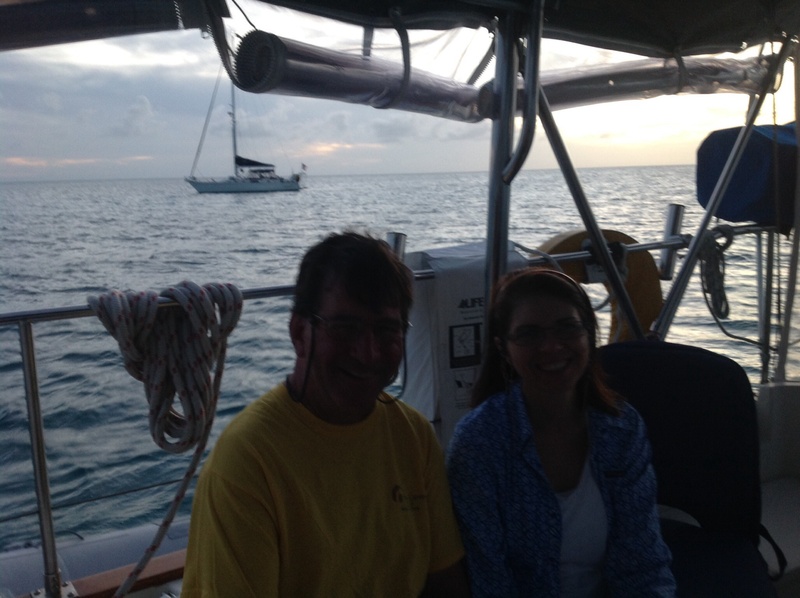 We enjoyed dinner on Eleanor Q and Annette brought the birthday brownies. Anthony and Annette silhouetted with Magnolia sitting in the background at sunset. Ems participating in the sunset tradition. There were a couple of little showers lurking around the area and this rainbow formed right by Magnolia. We took a short ride to a nearly deserted beach . . . there was really no one to be seen! 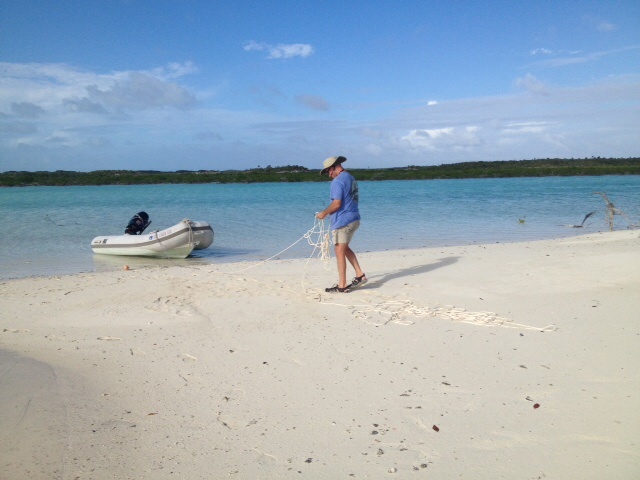 We prepared to anchor the dinghy to the beach . . .
Doh! Hate when this happens! He eventually got it straightened out. 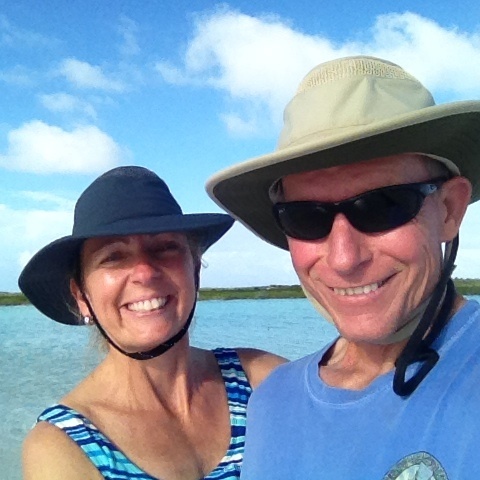 We were thoroughly enjoying our first few days in the Exumas! Sometimes you just gotta try a selfie – the newly added word to the US vocabulary in 2013. Sportin’ the hats! The next day we set out to explore the creeks on the island. 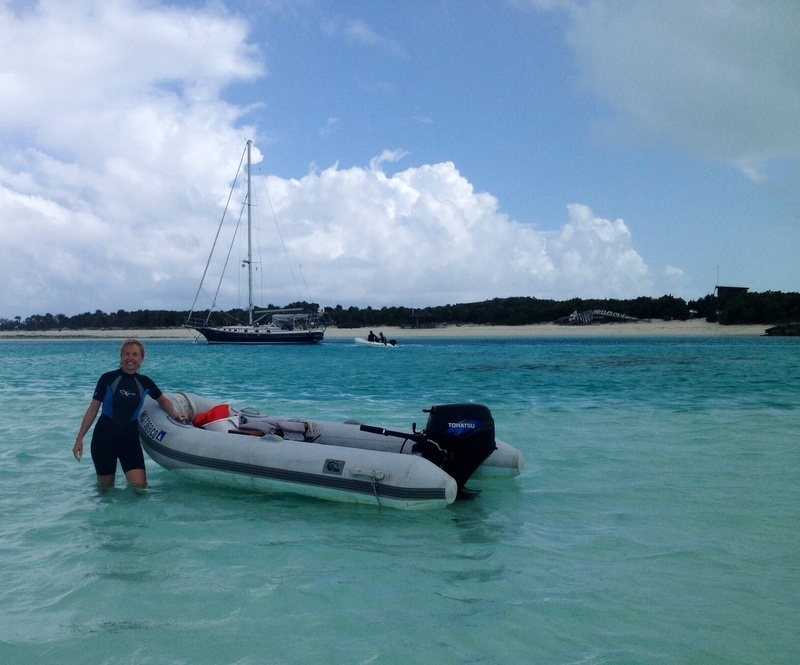 After a very long ride with some very shallow sections where we had to row or pole the dinghy (and a couple of places where we had to drag the dinghy!) 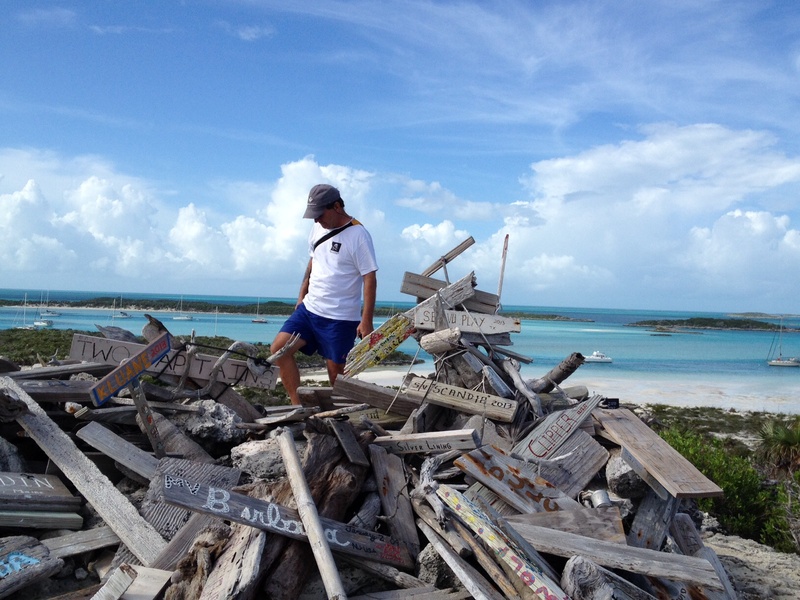 we made it to the Sound side of the island (the Exuma Sound – basically the ocean or western side of the island). We discovered the most outstanding beach. This is one of those obnoxious blue water pictures I warned you about. What a beautiful place to walk . . . so many shades of blue. 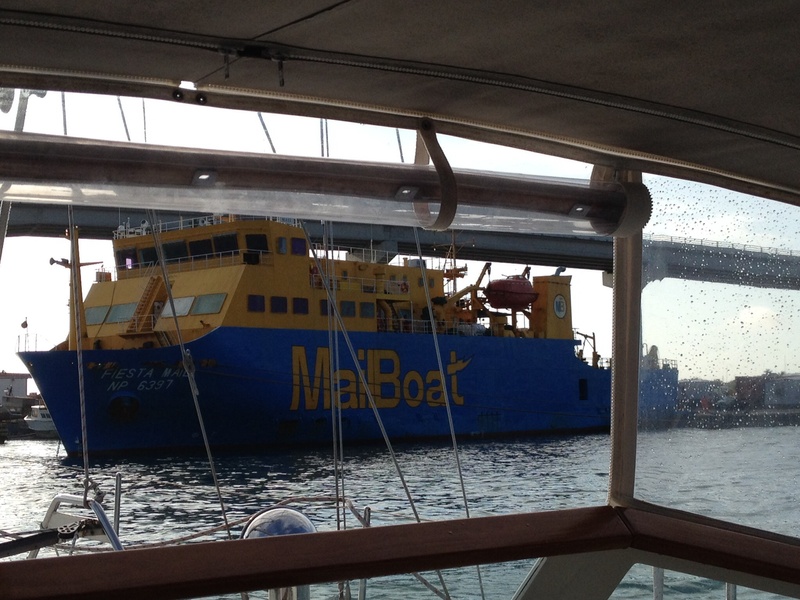 We met up with the crew of Magnolia and Mandala for a swim. What a wonderful afternoon. Next we headed to a place Frank has read about, day dreamed about, and visualized on those nights that he couldn’t sleep. We were on our way to Warderick Wells, also in the park. I would have to agree with him – that has got to be one of the prettiest places on earth. It has an iconic horseshoe shaped mooring field. And we got one of the prettiest spots of all, right in front of the park office. It was another really cool moment for us both, but especially for Frank. Once we got in there, it was hard to leave, and we stayed for five days. There we enjoyed the hiking trails, the snorkeling and just hanging out with our (now expanded) water family of Magnolia and Mandala. We loved every day there. Eleanor Q in her spot in the iconic mooring field. Pretty sure Eleanor Q likes being parked here! We saw the sign and followed it. I don’t think that meant WE were the blow holes . 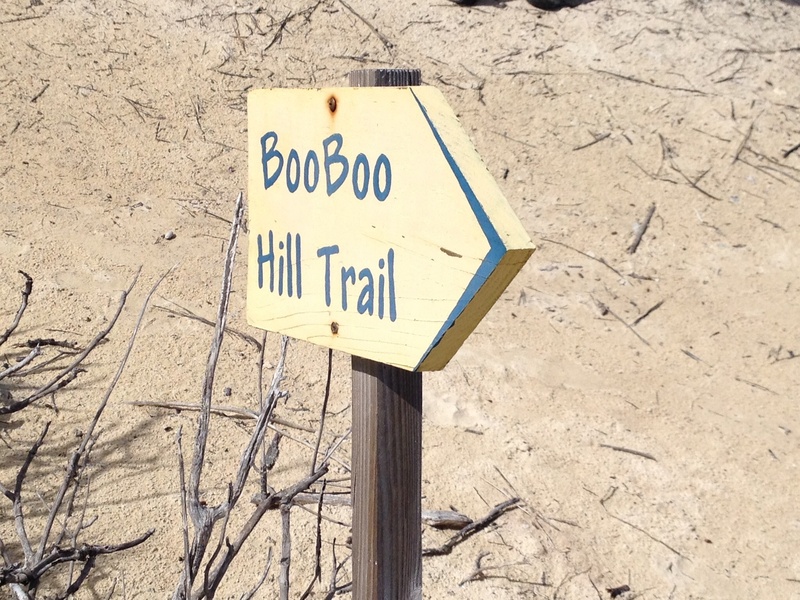 . .
One of the must see sights at Warderick Wells is Boo Boo Hill. Follow the trail up to the top of a bluff for a gorgeous view of the island, but also to see the offerings that have been left at Boo Boo Hill. So here’s the tale of the hill . . . It is said that, back in the 1800s, a ship load of missionaries wrecked on the island and met an untimely demise. It is also said that on the full moon you can sometimes here their spirits singing hymns. 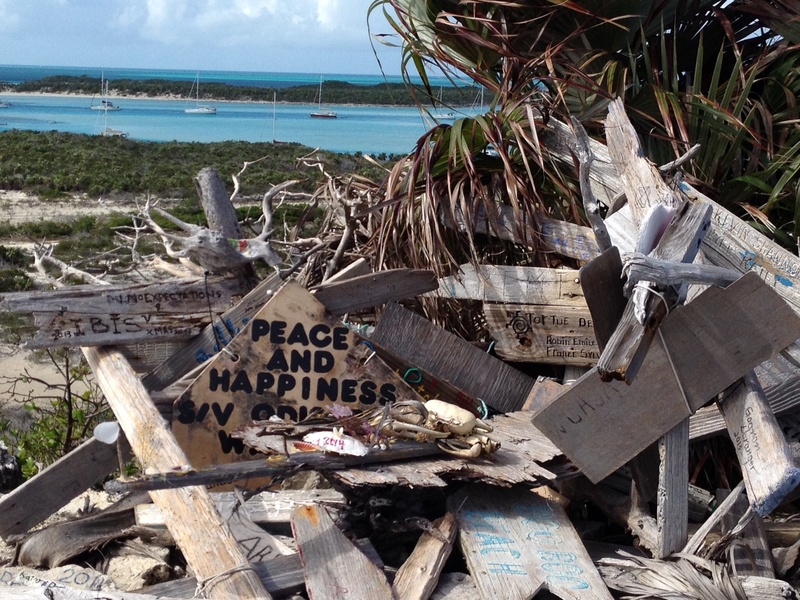 It is another tradition that when you visit Boo Boo Hill you bring a piece of driftwood with your boat name carved in it to leave as an offering. It is the one exception to the “don’t leave anything behind” rule. I must confess, we came woefully unprepared and will have to remedy that for our next visit. Anthony looking over the momentos left behind on Boo Boo Hill. The next night was, indeed, the full moon. I suggested to Annette that we should hide somewhere after dark and start singing, “Nearer My God to Thee” and see if we could freak anybody out. Between that remark and going empty handed to Boo Boo Hill, we got ours. 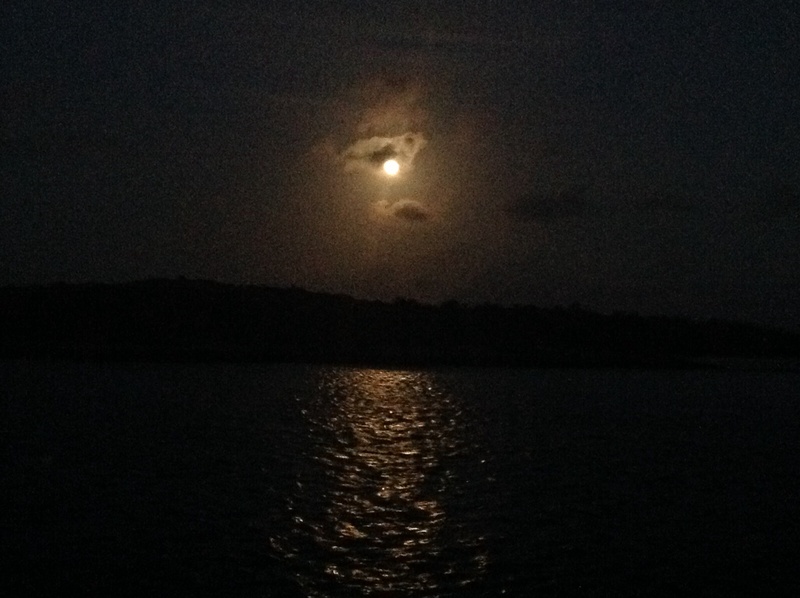 At about 9:00pm, the moon rose on one side of the boat and the lightning started flashing on the other side. Light rumbles of thunder could be heard in the distance. A couple of hours later, the heavens opened up and we had rain upon rain upon rain for hours that night – HEAVY rain. If you had a leak in your boat, you found out where it was that night. And then I started having very strange nightmares for most of the night. In the morning, I declared that the next time we went to Boo Boo Hill we were going to be sure to leave something with “Eleanor Q” on it and add it to the pile. Not that I’m superstitious . . . Frank and I both agree that it’s bad luck to be superstitious. But all the same, I’ll just think of it as insurance. I gotta say – it was a pretty cool full moon night! Spooky! During our visit, we snorkeled for hours! Now keep in mind, I grew up in West by God Virginia. There’s not a lot of snorkeling there. This stuff is ALL a stretch for me . 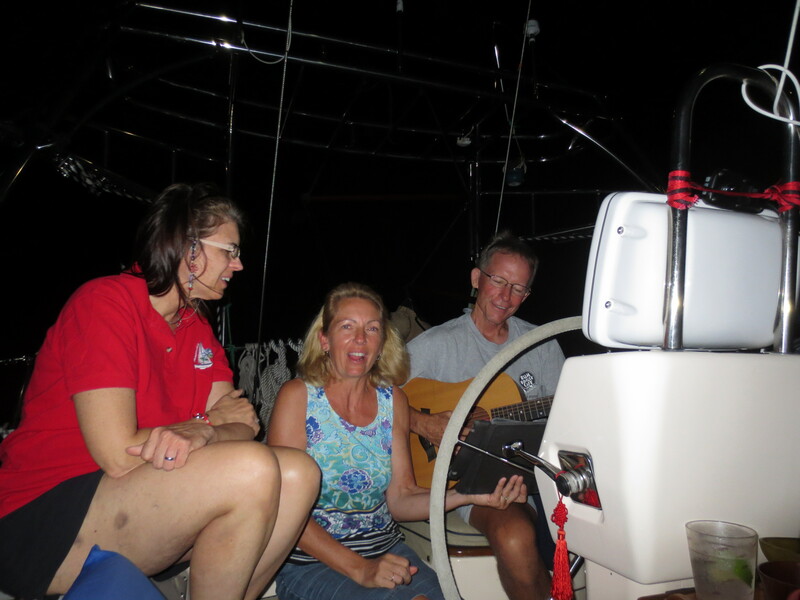 . . but my friends Ron and Nancy on Mandala were intent on getting me out there. And so the six of us set out to snorkel around the park. It was AMAZING and I loved it, much to my (and Frank’s) surprise and delight. It was only my second or third time and it was pretty cool. He’s so cool looking in his wet suit! This is a guy who just looks like he grew up around the water. Nancy took this picture of Ron and Annette about to jump in! 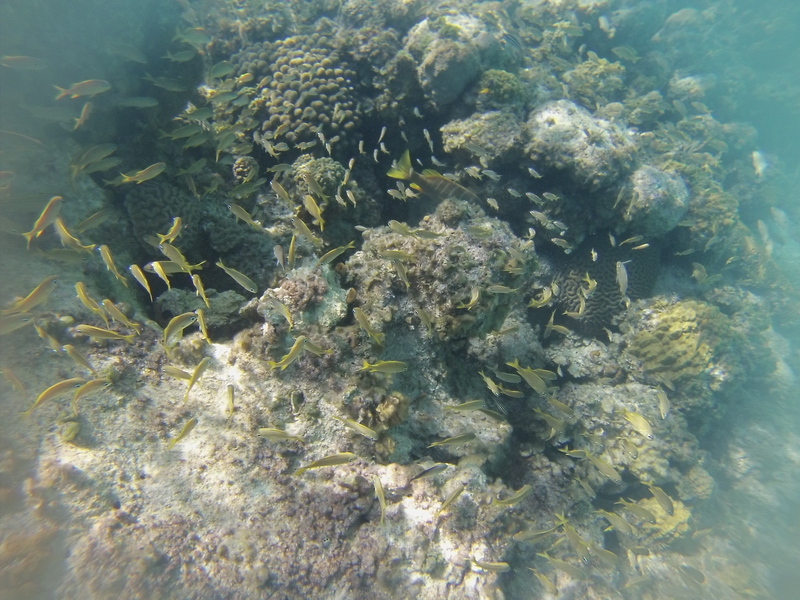 One of Nancy’s pictures from the coral garden in the park during our expedition. Beautiful fish and coral! 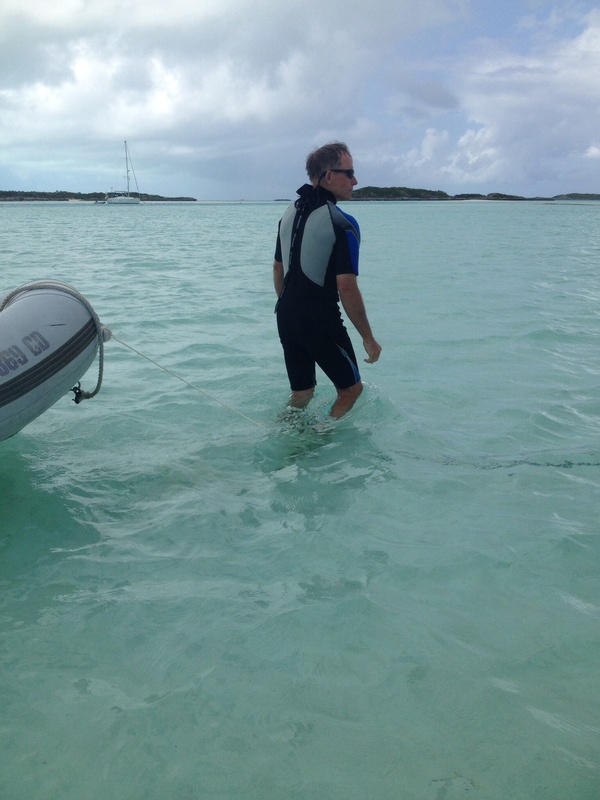 For those of you who have known me just recently, here I am in my wet suit coming back from snorkeling. To those of you who have known me from a tender age, here I am in my wet suit coming back from snorkeling . . . BA HA HA HA HA !!!!!!! One of our other favorite activities while at Warderick Wells were evening jam sessions! 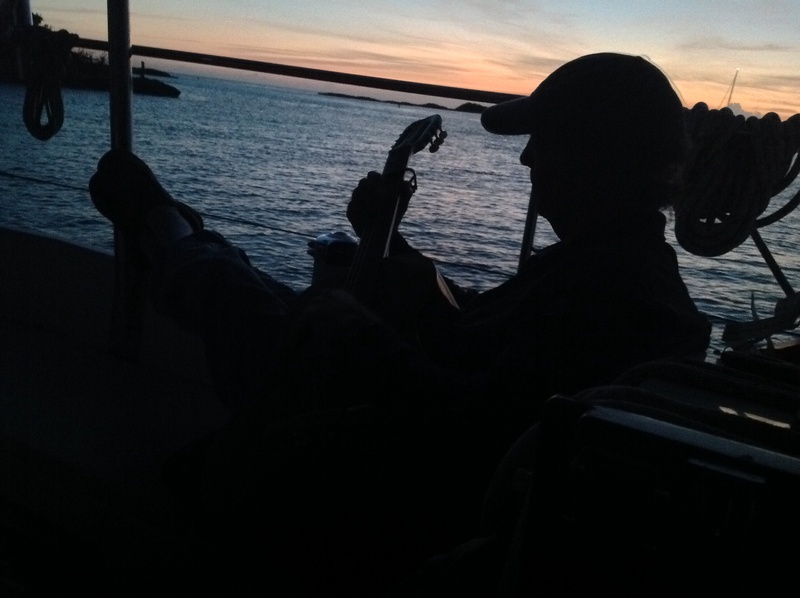 Ron also plays the guitar, so we’d pull out all the musical instruments we had on board and try to make some music. One night on Mandala we even attempted to do a group sing!! I don’t know if that had any influence on the catamaran next door taking off early the next morning or not, but I have my suspicions. Here we are attempting to sing! Not ready for prime time, but having lots of fun. After four days, it was time to move on. If that place had better internet, we might never leave. But we were ready to get into a little bit of civilization again, too. There are no restaurants, no shopping, no services in the park . . . and for the better part of a week, that was pretty okay with us. 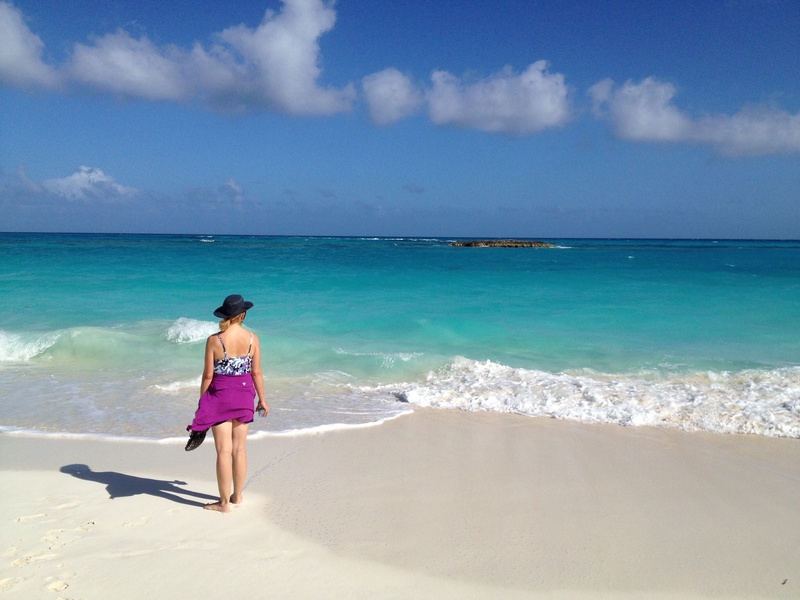 Time to go to Staniel Cay . . . but that will be the next post. Looking out over Warderick Wells . . . sad to leave. 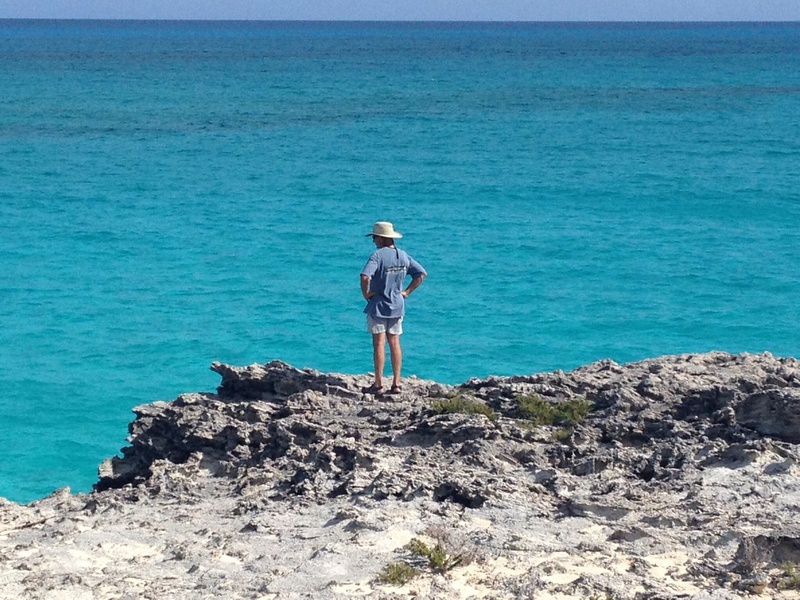 We had been in Bimini for almost a week waiting for the “weather window” to go to Nassau. Well, the window came. 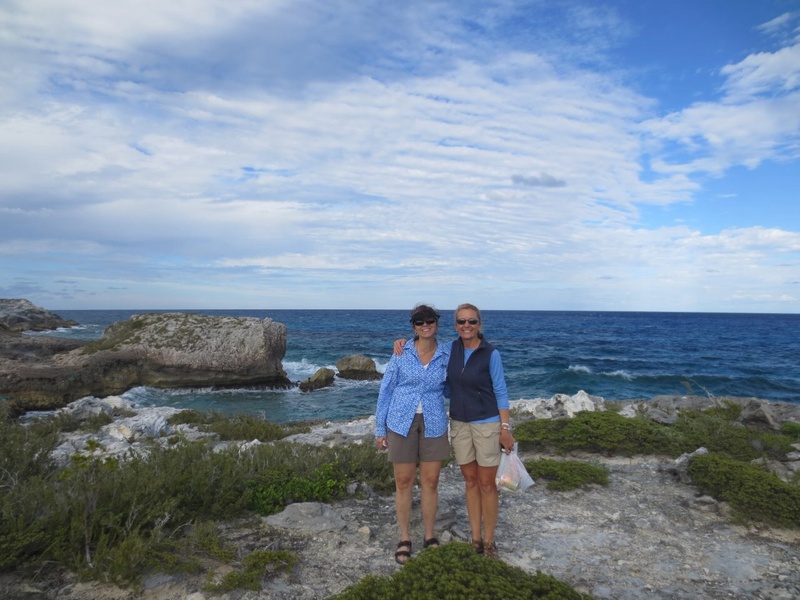 The trip to Nassau is about 100 miles requiring an overnight passage – not typically one of my favorite things to do, so I was looking forward to getting this behind us. But this passage turned out differently from the others because we ended up getting absorbed into a “fleet” of boats making the same passage. They were a group of Canadian boats and they called themselves “The B to B Fleet.” I’m not certain, but I think that stood for “Biscayne to Bahamas” since they met in No Name Harbor in Biscayne Bay. There were about 10 boats total, and the fleet captain would hold a check in every hour on the radio. Each boat would give a report of their position and conditions. We were all within a mile and a half of each other. Frank and I did 3 hour shifts – longer than on day trips – so that the other person has the hopes of catching a real nap. It was a big graduation day for me because he felt comfortable enough to go down below for 3 hours at a time with me at the helm overnight. That was a big deal. Anyway, the comfort of having a group of boats around and looking forward to the hourly check-ins was helpful. I got the 1am – 4am shift. Never in my life have I seen that many stars. 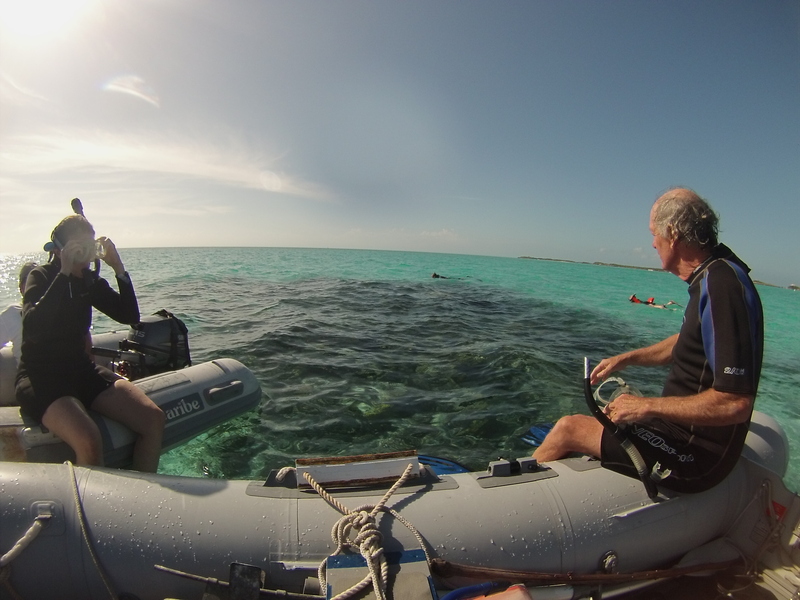 Other noteworthy things about the crossing: the first part goes over the Bahama bank which is hours of going through water that is 10 – 15 feet deep – shallow. Then you get to the Northwest Passage into the “Tongue of the Ocean.” That’s where you transition from the shallow water of the bank, through a cut and into the open water. Frank took us through that part, but I had to stay up long enough to watch our depth finder go crazy. We were looking at 20 feet of water, and then the numbers started soaring up . . . and then it did that blinking thing when it can’t compute any more. The ocean drops off to a MILE deep. A mile. What kind of glacier did that architecture? A poignant moment came at the early dawn check in when our friends on Mandala shared with the group that their on board 18-year old cat passed away during the crossing. They found it fitting to have a burial at sea at the Tongue of the Ocean in the mile deep water. The air waves got strangely silent as I think a couple of tears were shed throughout the fleet. 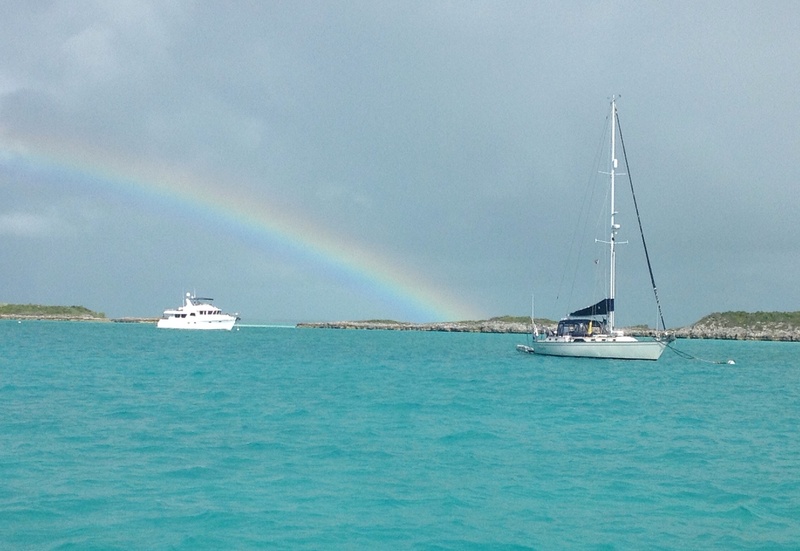 After a quiet night of listening to good music and watching the stars and going through a couple of early morning rain showers, at 8am we were pulling safely into Nassau Harbor (after radioing Harbor Control and requesting permission to enter, of course.) 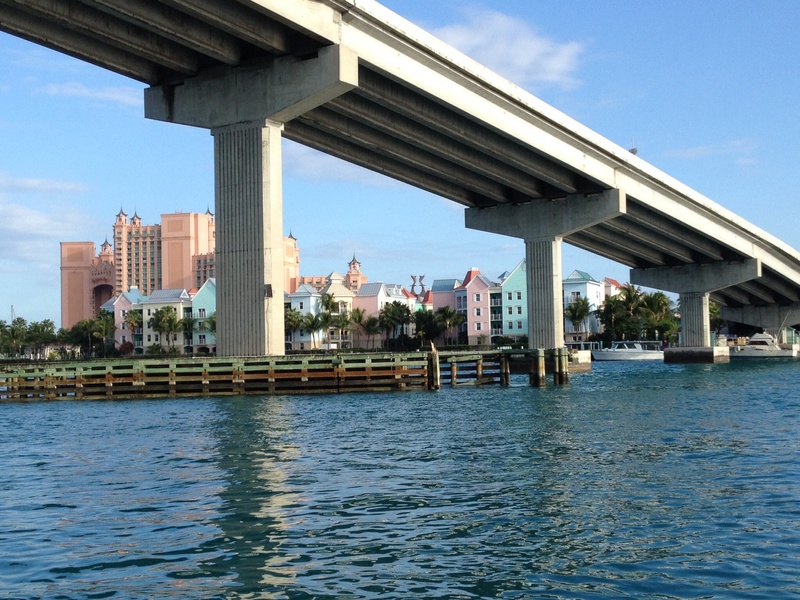 We slid by cruise ships and mail boats and ferries to get to our home for the next few days at Nassau Yacht Haven. Our first day was catching up on some sleep and doing laundry. 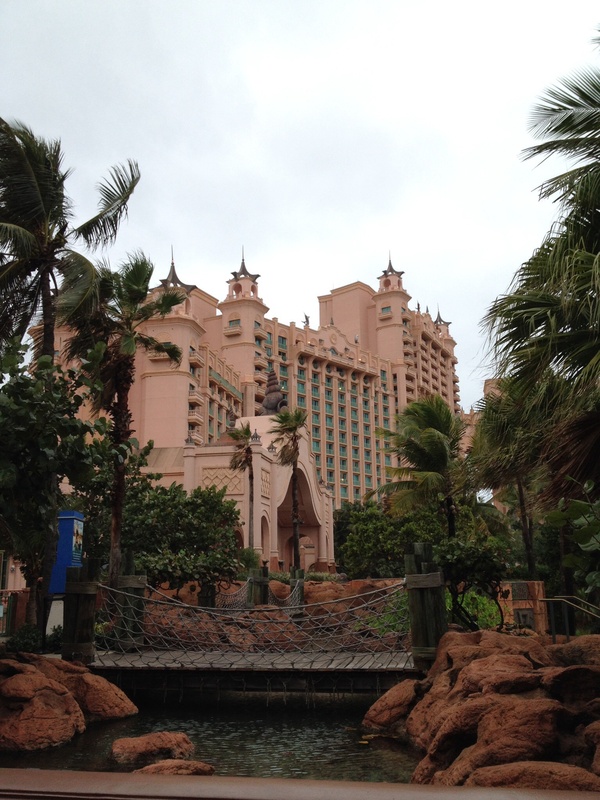 The second day was spent walking around Potters Cay by the docks and then across the bridge to Paradise Island area and the Atlantis Casino. You know we had to drop by there and see if we knew anybody working. We did not. Frank checking out the fishing boats of course. 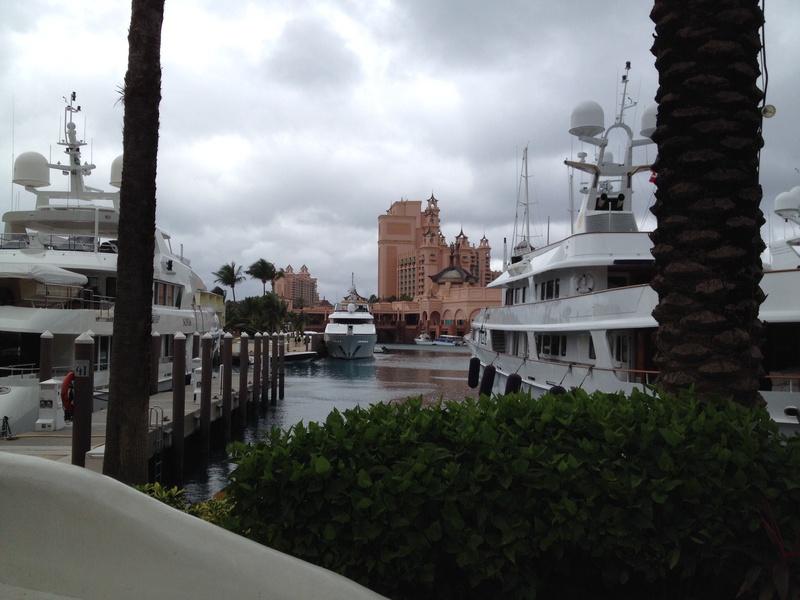 Mega Yachts in the marina at the Atlantis. 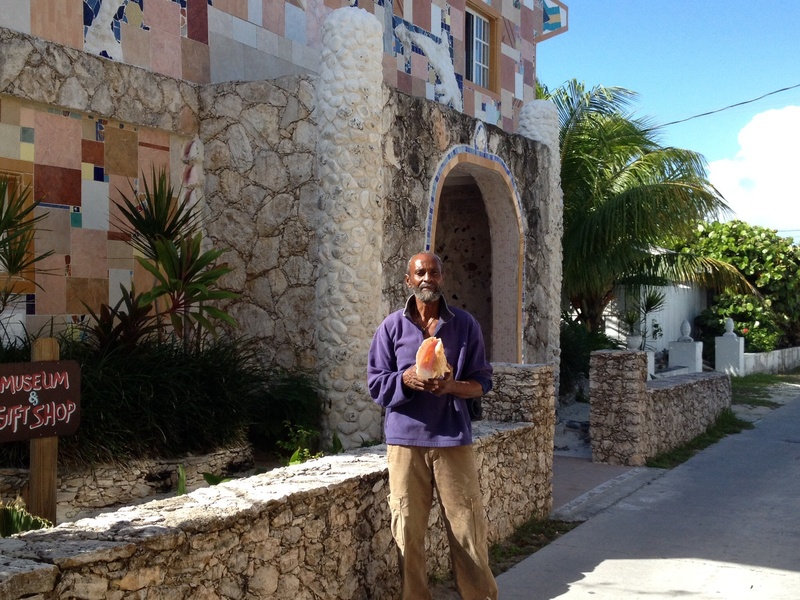 But our next day was the day I had been waiting for and the main reason to pass through Nassau: to visit my friend Mr. Rolle. I met my friend Mr. Rolle on an airplane about ten years ago. 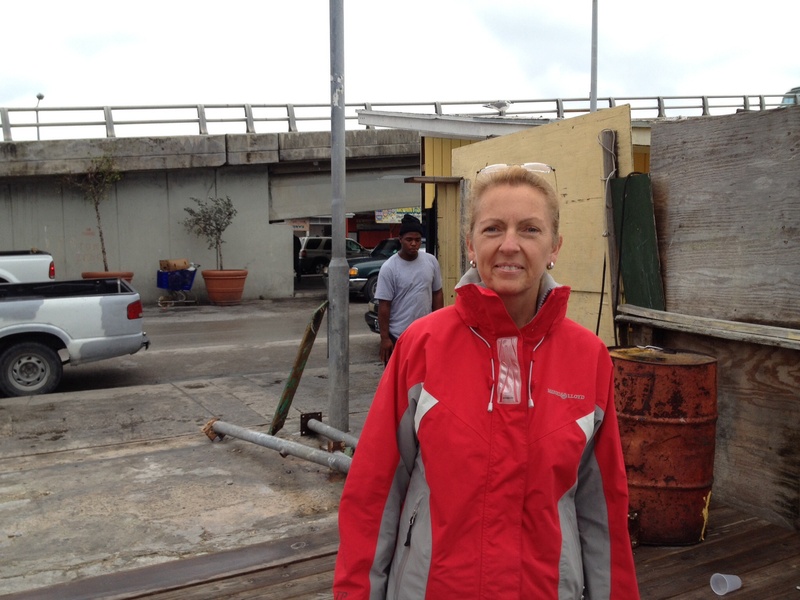 Mr. Rolle and his wife and much of his family are Nassau residents. He and his wife were flying back from the midwest and their flight had been canceled. They were put on the last two seats on the plane I was on and his seat was right beside mine. He was sweet and engaging and we shared a background and love for church music which made for easy conversation. We were friends by the end of the flight and exchanged information and promised to keep in touch. Before we got off the plane, Mr. Rolle sang “God Be With You ‘Til We Meet Again” to me. And then we became pen pals and he would periodically phone to check on me and to let me know he was keeping me in his prayers. He was much better at keeping in touch than me, but we kept the thread going over the years. And then when I said that we’d be sailing to the Bahamas, we hatched the plan to set up a visit. 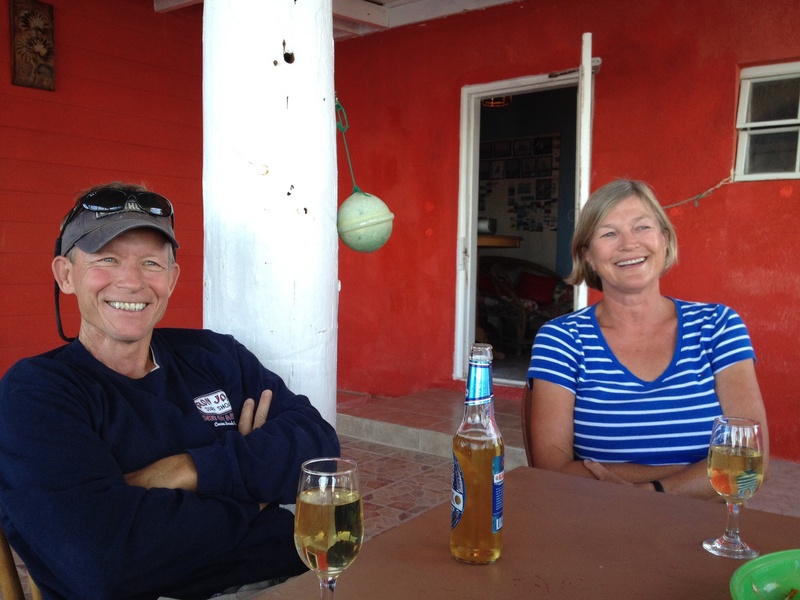 So I was very excited when Mr. Rolle called me to say that his daughter, Sharrie, would be driving and they would come pick Frank and I up at 10am at the marina, show us the island, take us to the house for lunch and then return us later in the afternoon. I was so excited when the car pulled up and I saw Mr. Rolle looking nearly the same as he did ten years ago! The four of us took off and Sharrie was a great tour guide showing us the sights of the island that we would never have been able to see by foot. 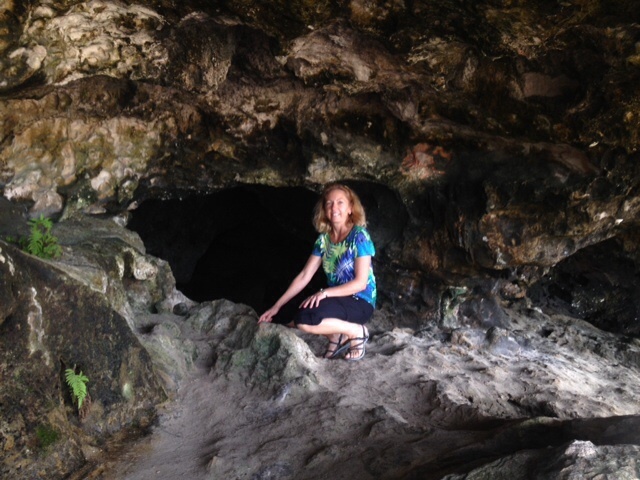 We saw neighborhoods and developments and schools and churches, and the town center and then stopped by “The Caves” for a look around. The Caves – The Buffy Flower Bat lives in this cave. I did not call out to the Buffies. I just took the sign at its word and called it a day. 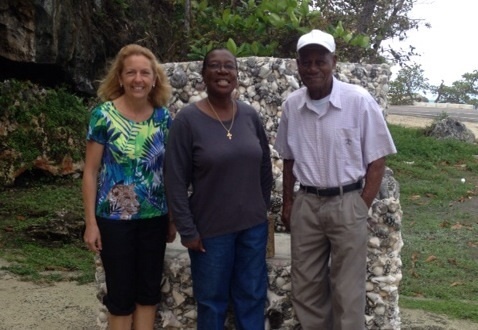 Next we went to their home for a delicious lunch and I finally got to meet Mrs. Rolle! They filled us with wonderful food and we enjoyed fun conversation. I was very touched that two of the pictures that I had sent to Mr. Rolle had made it to his bookshelf of family photos: a picture of Frank and I and a picture of my father and I. A little more history: Mr. Rolle sent me a copy of his CD of hymns, and I told him the story of listening to his CD in the car when I drove home from Princeton after my father died. So I had to catch a little breath when I saw the picture of me and my dad there. Mrs. Rolle was very warm, gracious and beautiful. Mr. and Mrs. Rolle. 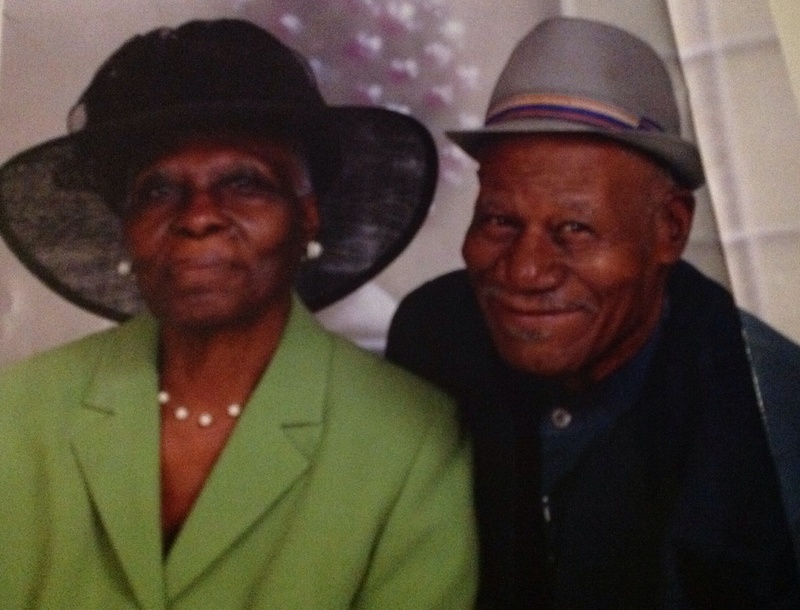 I borrowed this picture from a beautiful article in their church magazine that spotlighted Mr. and Mrs. Rolle. She/they have raised a large flock of children and she is a retired school teacher. And they have quite the flock of grandchildren as well! Their children hold various jobs in the community, were raised to volunteer their time to help those less fortunate, and are all very active in their churches. Like her father, Mr. Rolle’s daughter, Nadia, is a great pen pal and has recently been the family communicator with me since I could send her emails along the way to update her of our plans. So I was so thrilled that Nadia was able to zip home on her lunch break from the high school where she teaches so we could meet face to face, even though it was only long enough for a quick hello and a hug! So shout out to my new Facebook friends Nadia and Sharrie! Then we stopped by the Rolle’s home church (by my request!) 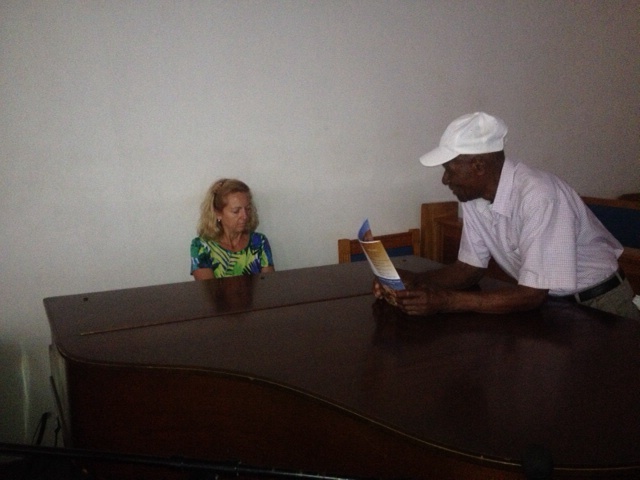 and Mr. Rolle and I spent a few minutes having an impromptu hymn jam session in the church. (Can you use those two terms in the same sentence?) He sang and I would try to fill in with some accompaniment behind him on the piano. I could have done that for hours. What a smooth, crooner’s voice! 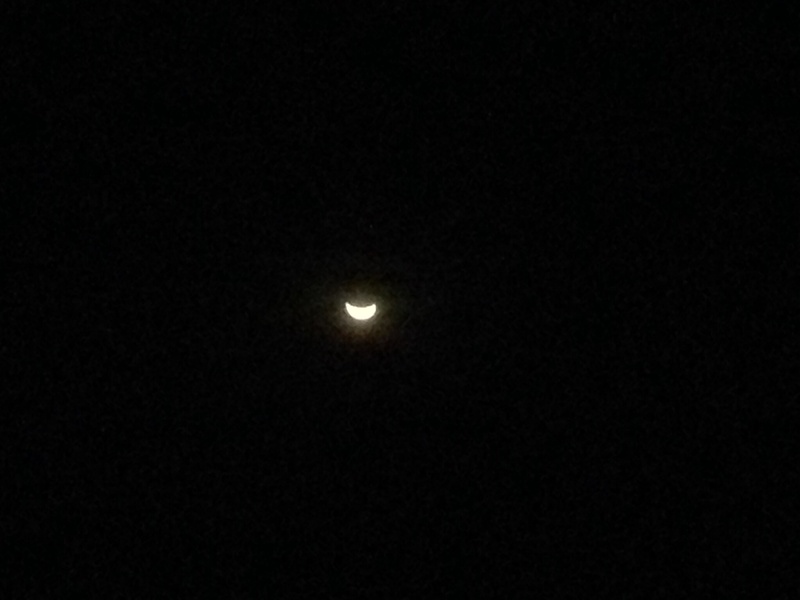 Frank looked on and smiled. He knew I was having a good time! And then it was time to go back. 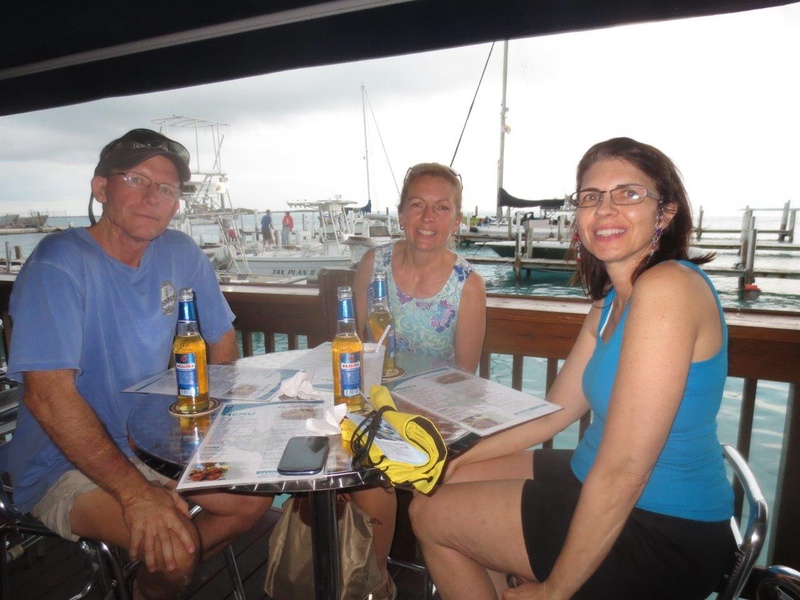 I was so happy to get to see my friend and to get to know more of the Rolle family, and I look forward to our sailing travels taking us through Nassau again in the future so we can visit some more. 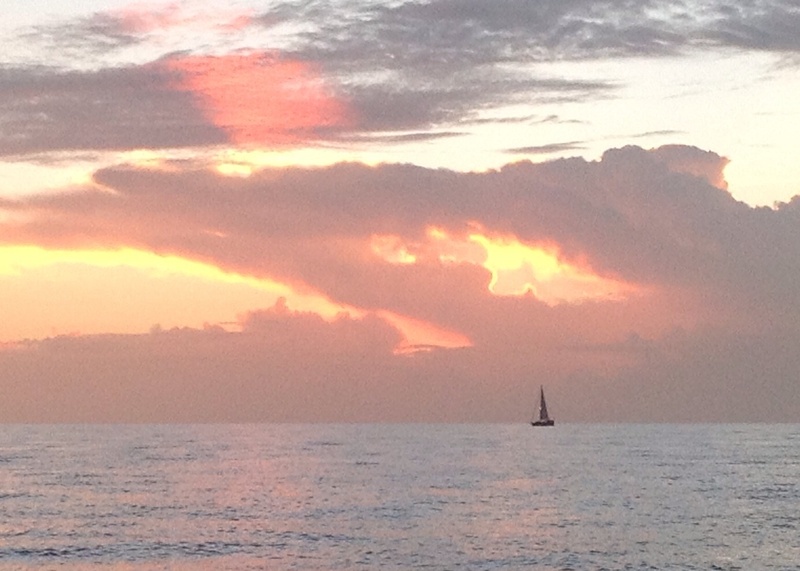 And so, my friends, that’s how we roll in Nassau. 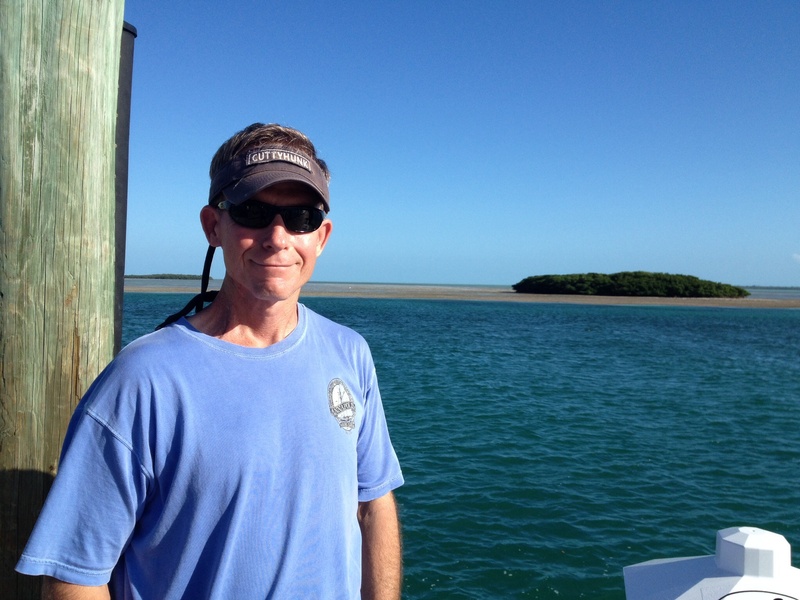 We staged our departure from the U.S. in Biscayne Bay just south of Miami. We listened to and studied all the weather information we could get our hands on looking for the right weather window. 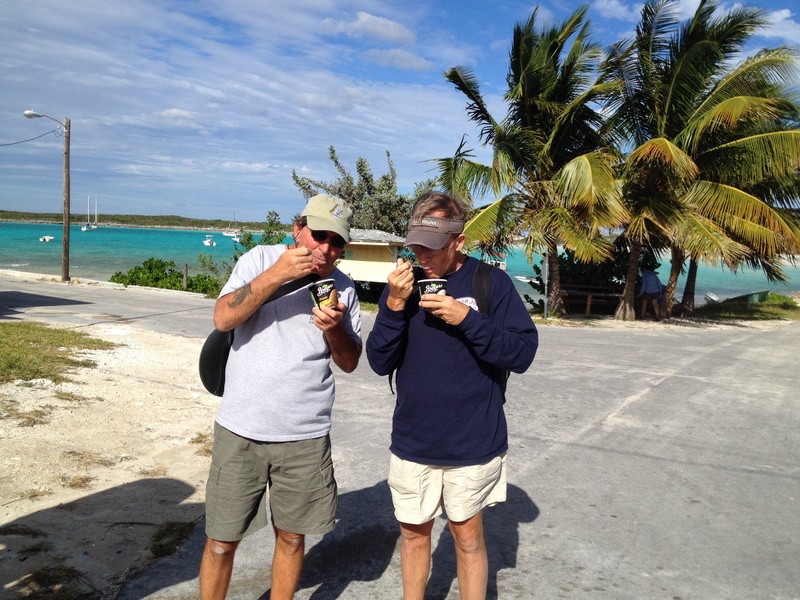 The weather and wind direction/speed determine what part of the Bahamas to aim for and whether it will be a day trip or an overnight trip. 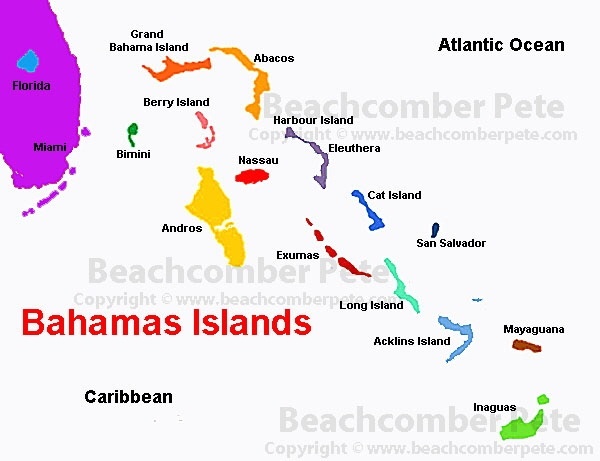 There are LOTS of islands in the Bahamas, so you have to determine which part of the Bahamas you want to visit. 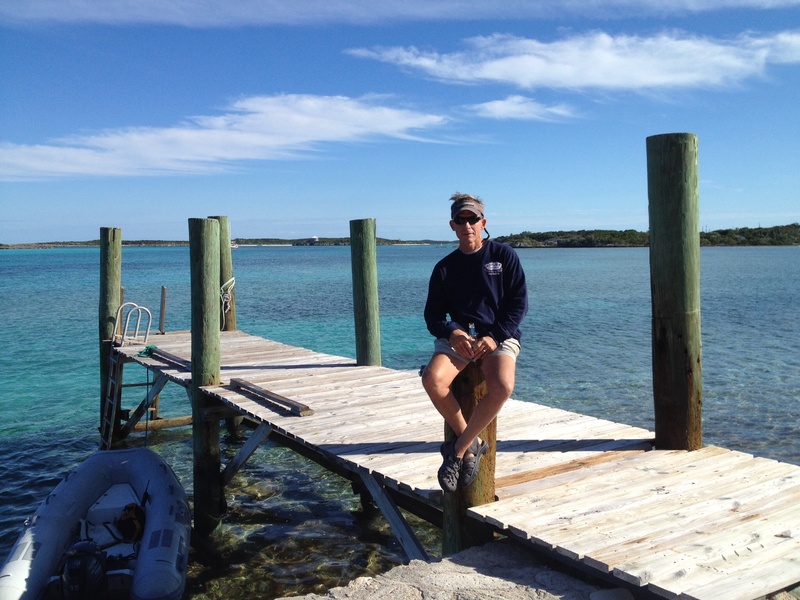 We chose to do the 50ish mile day trip from Miami to Bimini. 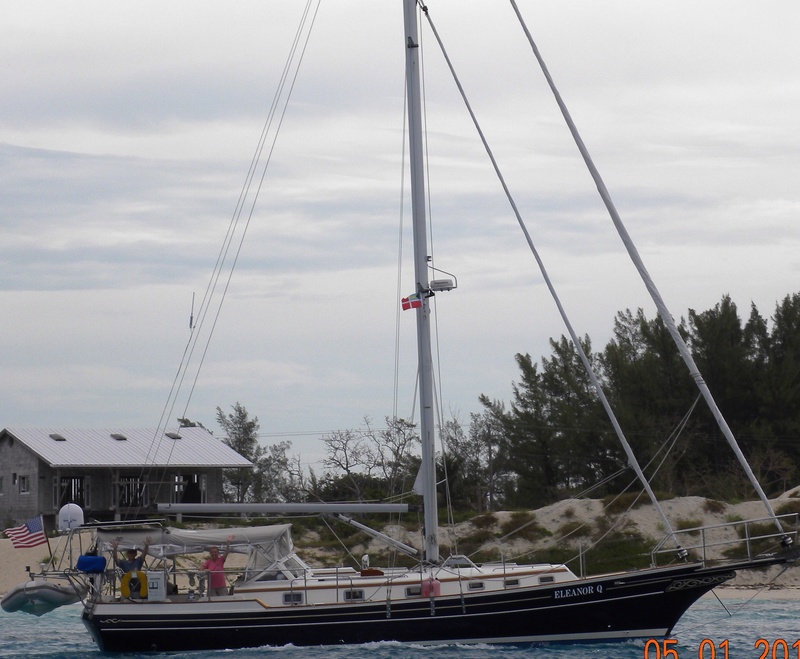 Our next jump, which will be longer and will require an overnight trip, will be to Nassau. 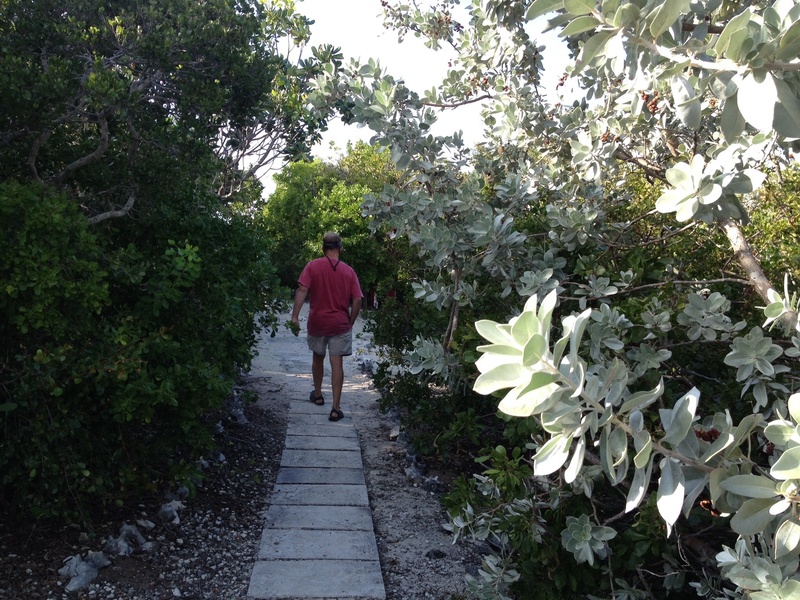 Then we will head down to the red chain of islands, the Exumas. If we can tackle that much in the next few months, we will be thrilled. We have learned from this summer that you can’t see and do everything, and that you can wear yourself out trying and not have nearly as much fun. 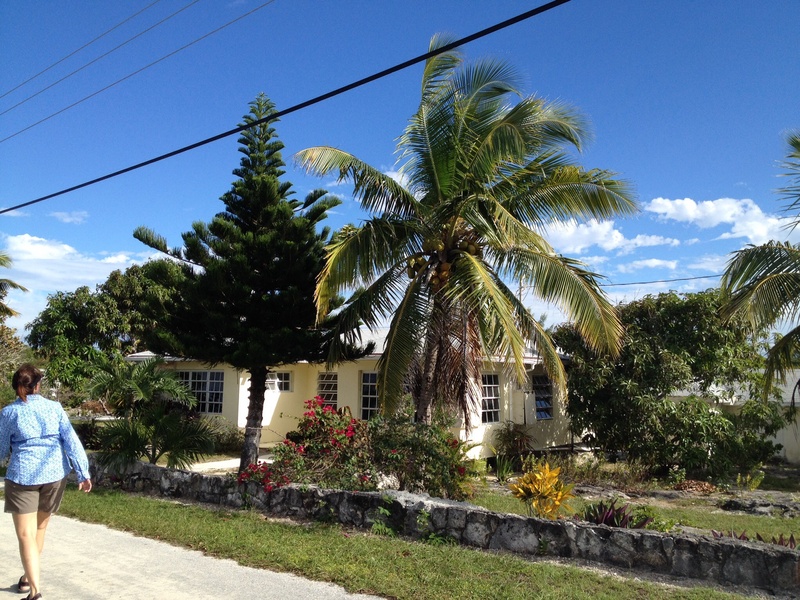 You can see how close Bimini is to Miami here. Frank and I have both gone through our various phases of anxiety prior to this crossing. Generally we would trade days (which is good). Some of it, for me, was the anxiety of the crossing itself. Some of it was leaving the ease and comfort of the U.S. with good cell phone service and internet. Some of it is being far from family at a time when I feel I should be closer. 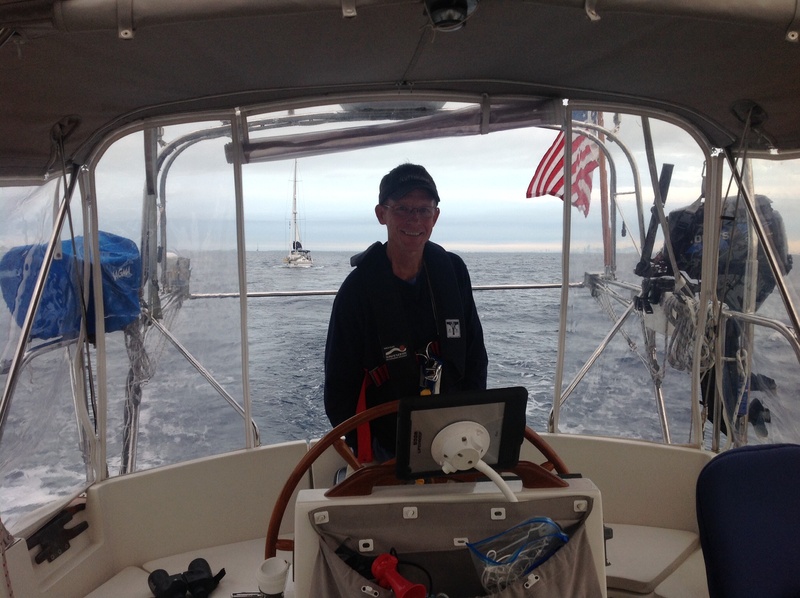 Frank’s anxiety was mostly around being MORE separated from family and always his anxiety is about making sure the boat is in safe and working order. We had ourselves pretty worked up by the time we left and neither of us got much sleep the night before we left. I say all that to lead to this point: a strange thing happened when we got in the middle of the Gulf Stream with no land in sight in front of or behind us . . . we relaxed! We couldn’t check the internet, so we DIDN’T obsessively check it every five minutes as we are known to do. It didn’t make our concerns about family go away, but we did look at each other and say, “What were we so worked up about?” We just let go a bit. 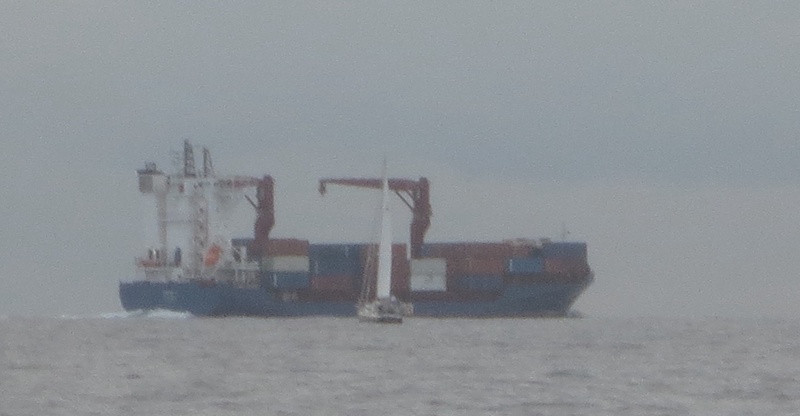 There were probably a dozen other boats within sight of us most of the way. We passed a couple of tankers along the way. 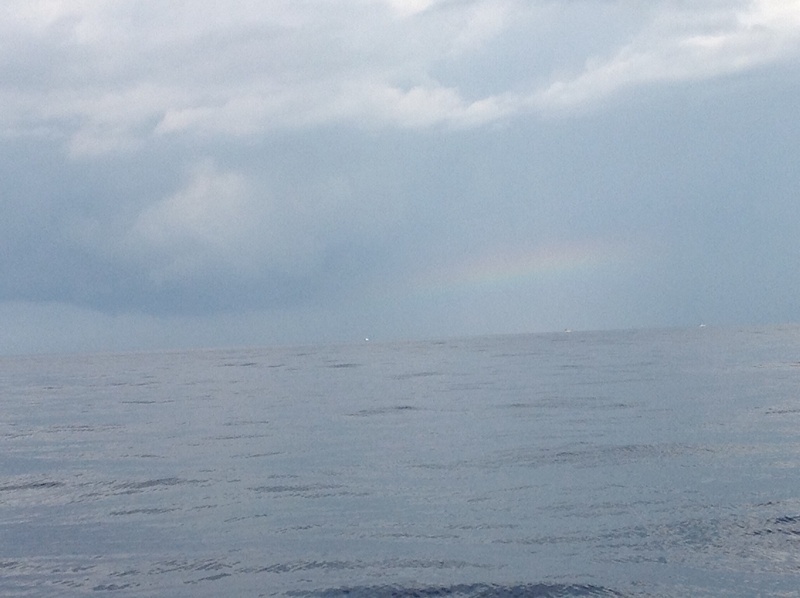 We saw a couple of squalls in the distance, but we were lucky that we dodged them or they dodged us. Frank said he did notice a water spout off in the distance which he wisely did not mention to me. I think I watched the Wizard of Oz at too early of an age and have a rather keen dislike of anything resembling a tornado. But the squalls were small and isolated and had no impact on us. 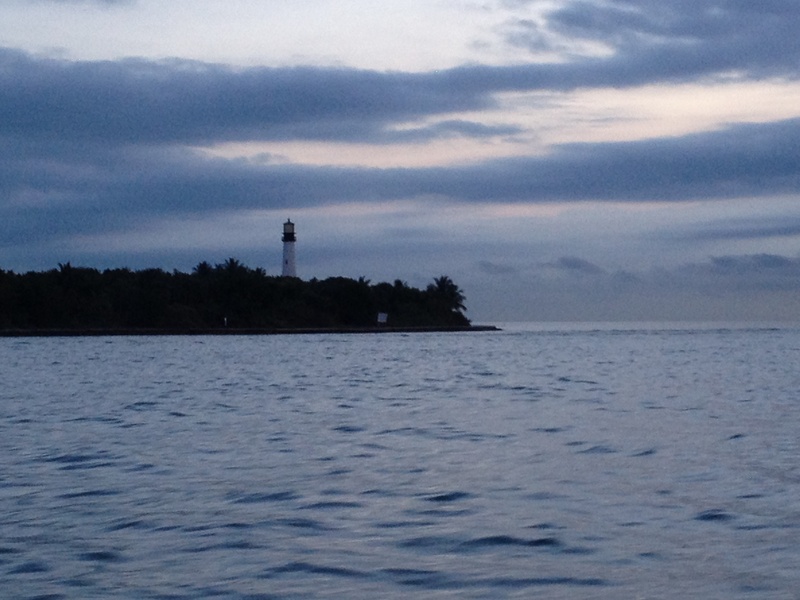 Leaving Biscayne Bay in the early hours of the day. Magnolia took this shot . . . makes it look like we’re chasing down the freighter! I promise we were not as close as this makes it seem. 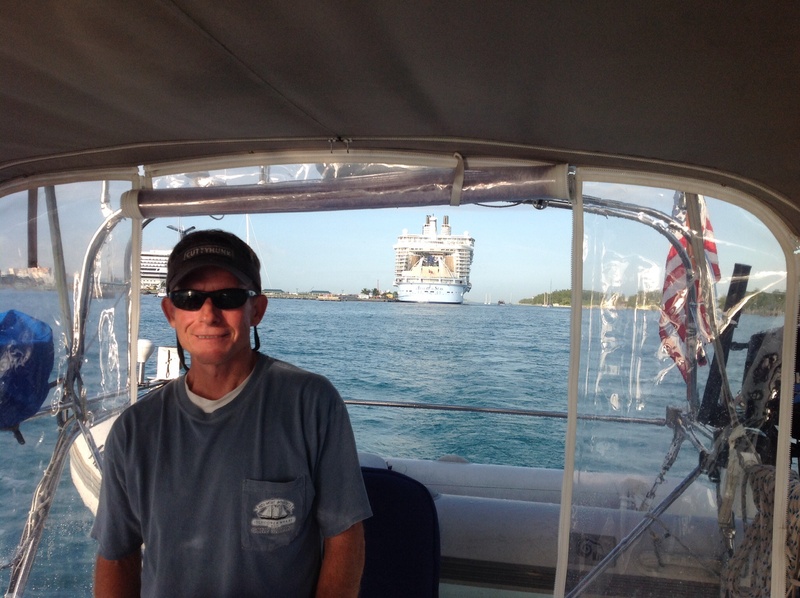 Captain at the helm underway to Bimini! Magnolia behind us. Rainstorms actually show up on radar. 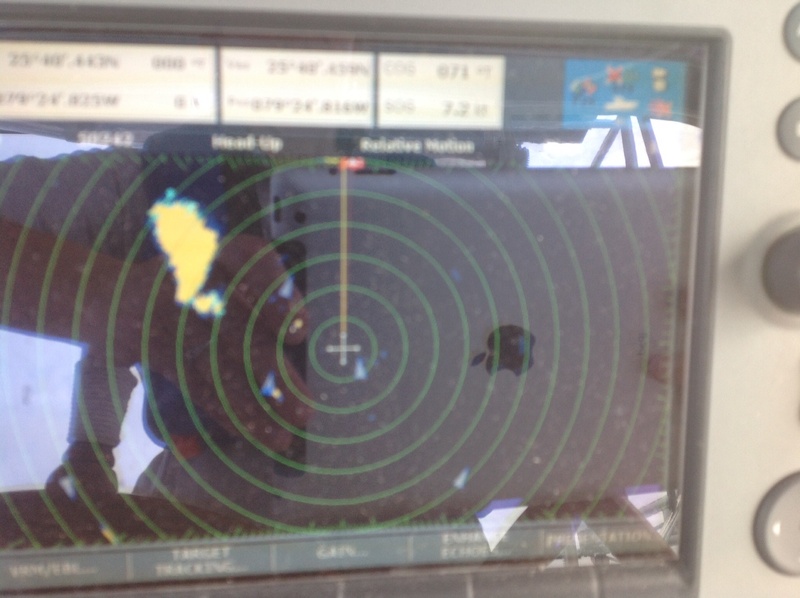 Here’s the one we were keeping an eye on – the big yellow blob..
At this point we were traveling at about 6.3 knots. We decided not to play chicken with the storm and hung a left to avoid it. That was the first time we could really recognize the Gulf Stream . . . changing our heading put us more directly in the flow (instead of perpendicular to it) and we shot right up to 8.1 knots!! Nice. 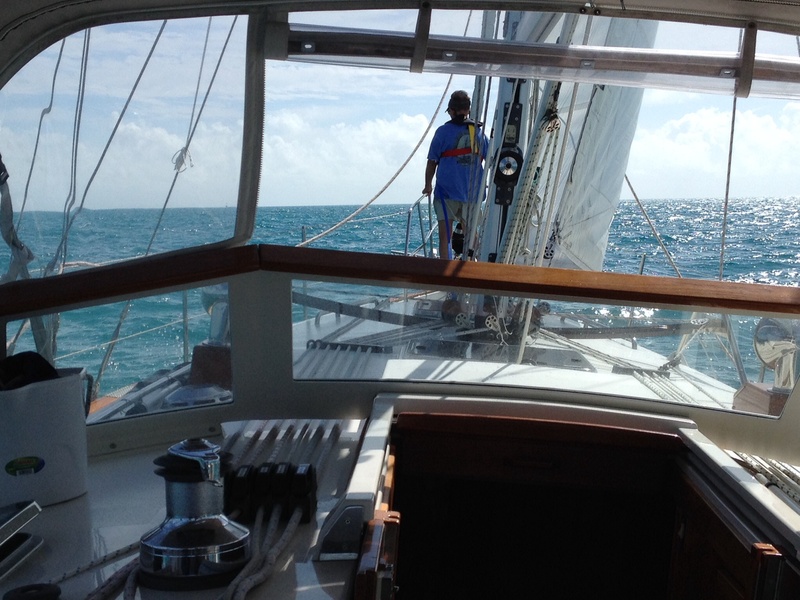 We were only about 8 miles from Bimini and on the home stretch! 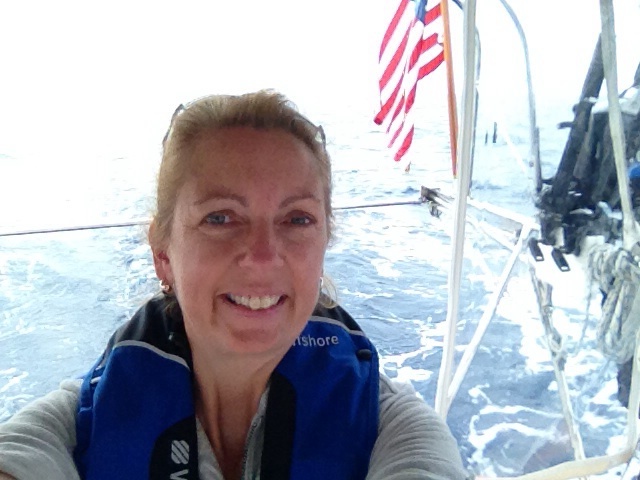 Ems on watch and feeling pretty good with Bimini in sight! 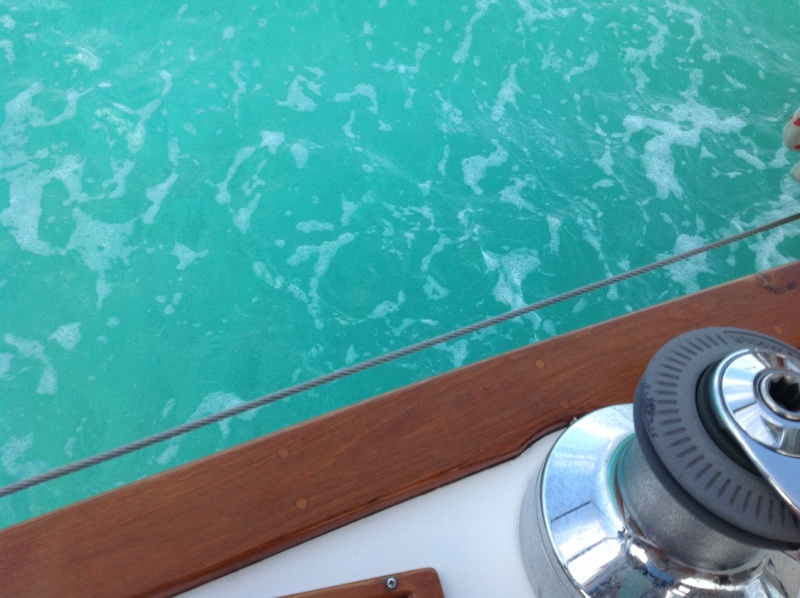 Even after seeing pictures, we couldn’t get over seeing how blue the water really is. Land ho! 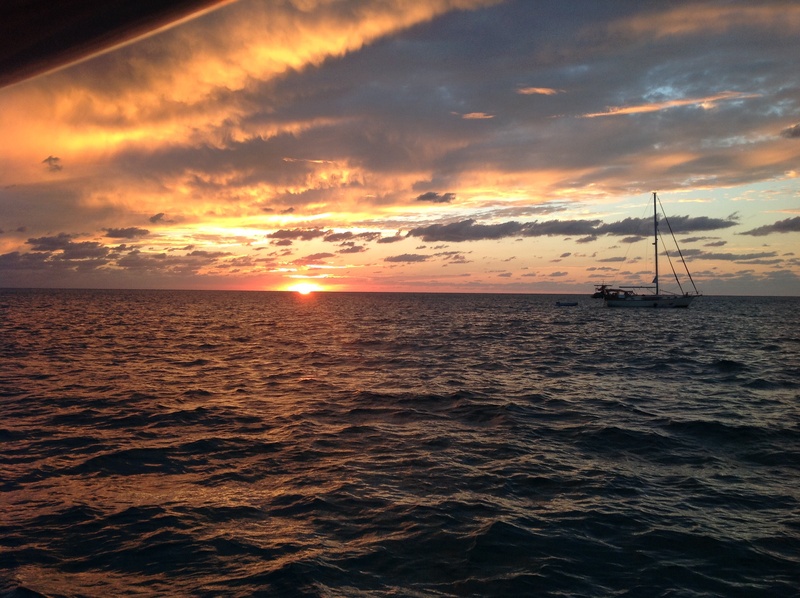 Bimini in sight! Quarantine flag at the ready. We came into Brown’s Marina with a flotilla of boats from Canada! We have had a fun several days getting to know our boat neighbors in the marina. 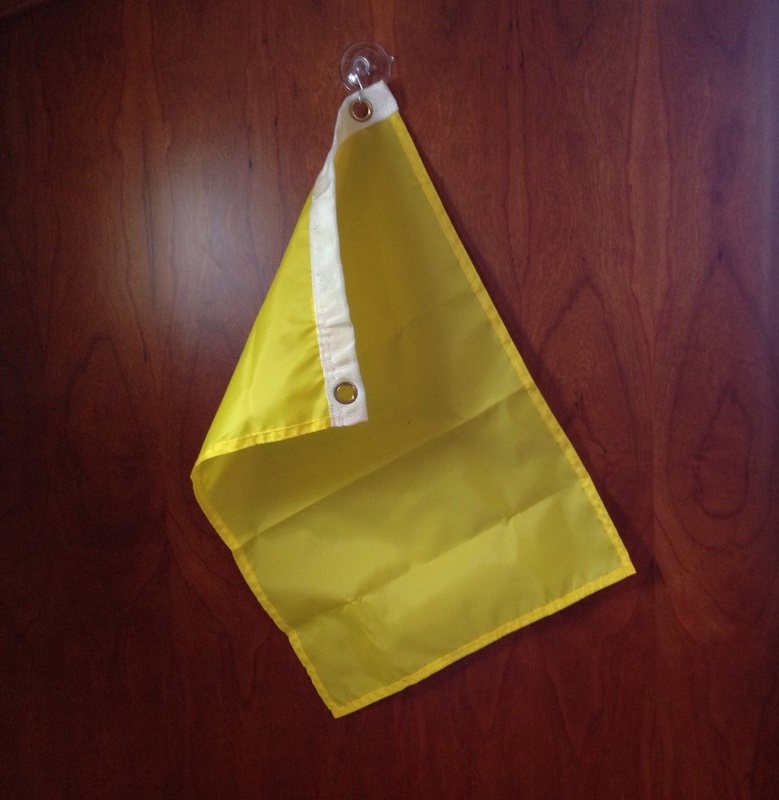 Customs cleared, we could take down the yellow flag and raise the Bahamian courtesy flag. Excellent. 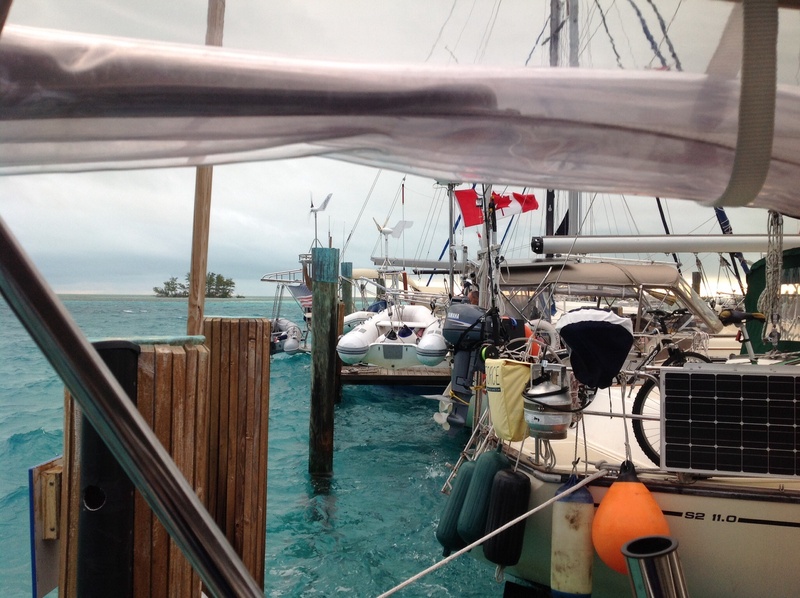 Frank returned from customs and the yellow flag came down and the Bahamian courtesy flag went up! 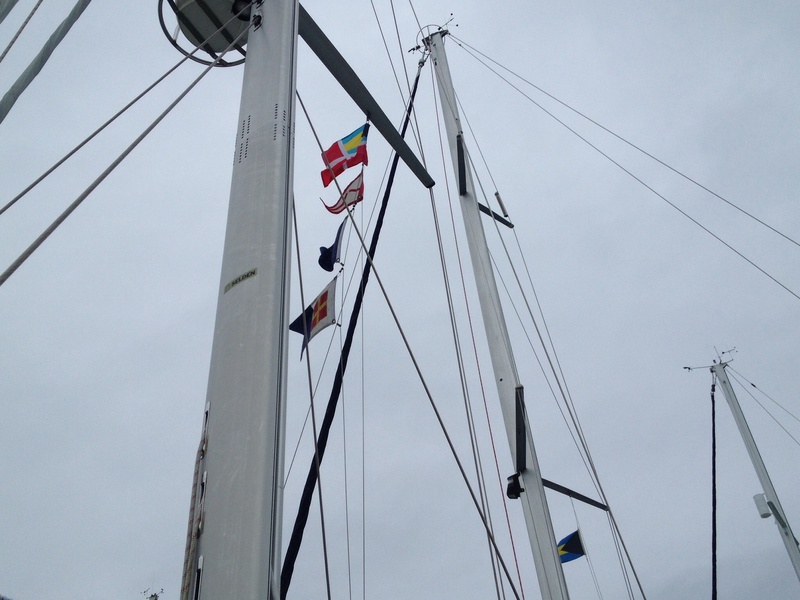 You always fly the flag of the country you’re from on the stern and the courtesy flag of the county you are visiting in the rigging. After walking to the BTC office to get cell phones and SIM cards for communications, the exhausted crew stops at Big John’s for dinner. Dinner is coming . . . I know all you see are beers. Anthony is behind the camera. 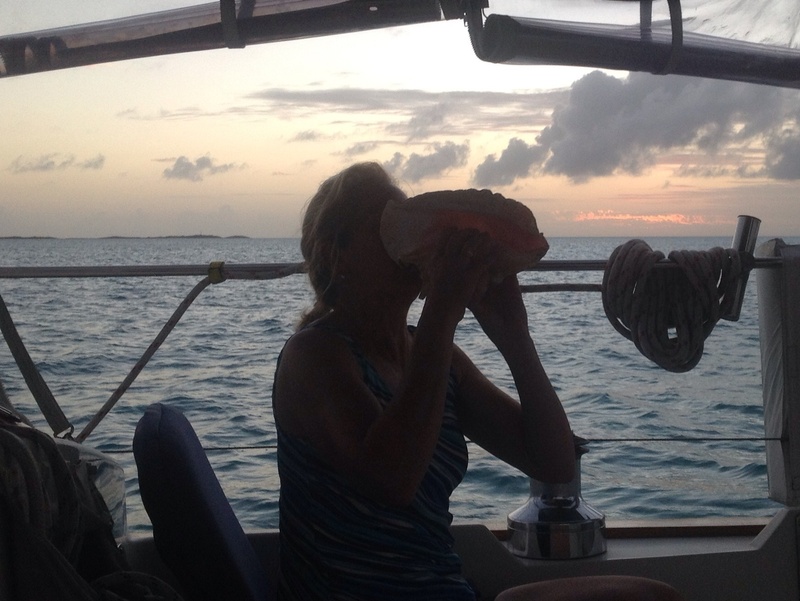 We all toast to the fact that we made it to the Bahamas by boat. One of the boats in the marina took it upon themselves to organize a cruisers pot luck the second night here which was also New Year’s Eve. 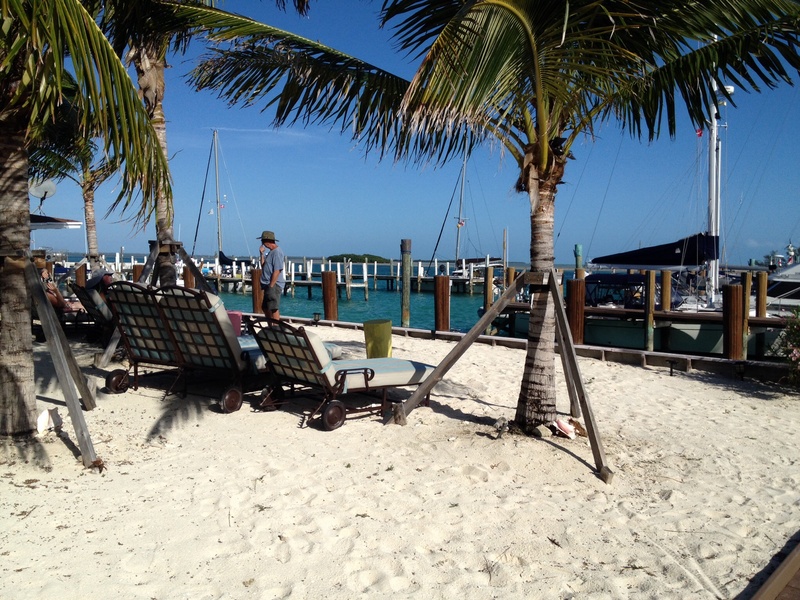 The marina has a beautiful area with glass top tables and charcoal grills which we took full advantage of. 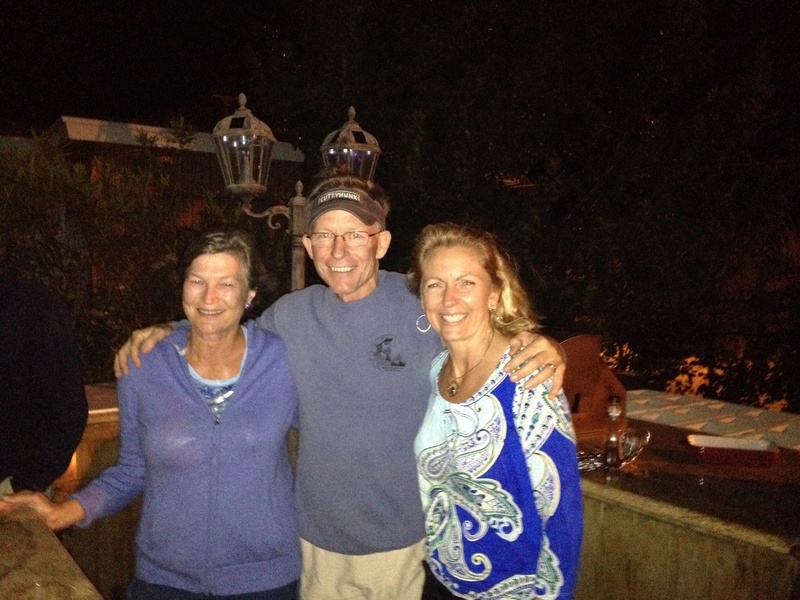 A good time was had by all getting to know other cruisers and swapping stories and agendas for the winter. 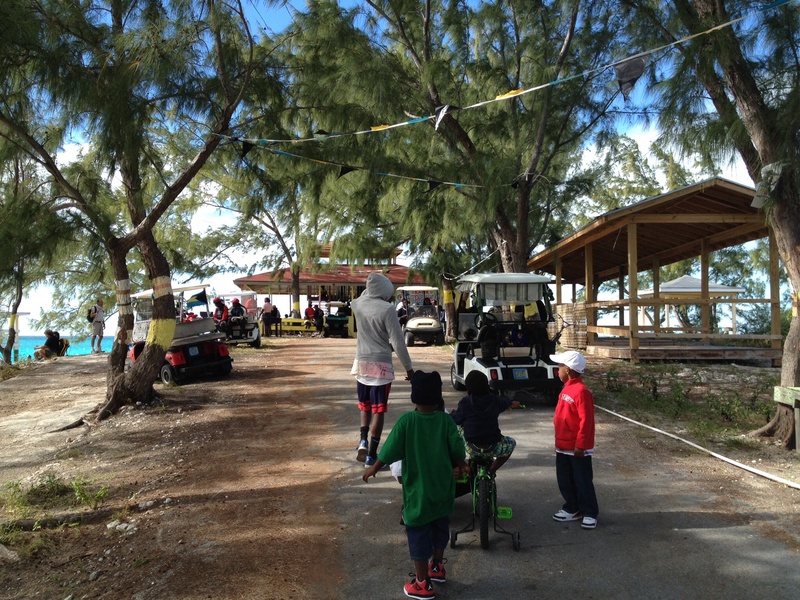 The following days have been full of walking on the beach, fishing from the docks, visiting with neighbors, New Year’s Eve parades, walking along with the Junkanoo parade and general fun and relaxation. 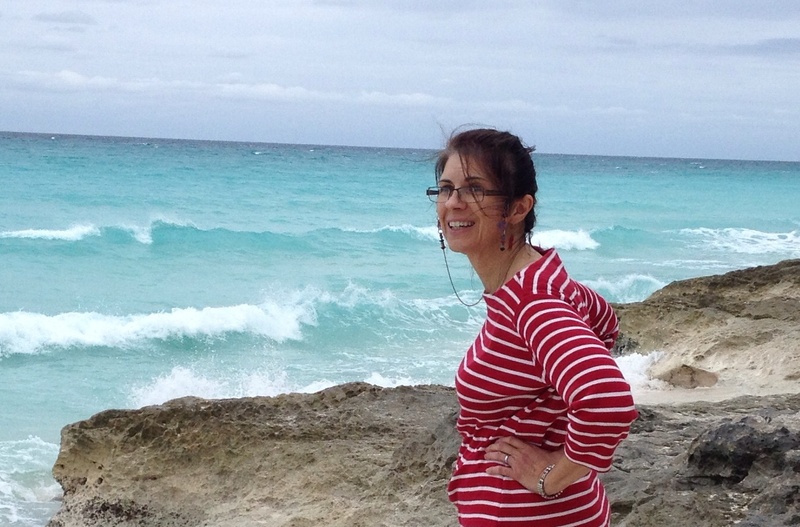 Annette and I took a great walk on the beach our first full day and explored town. 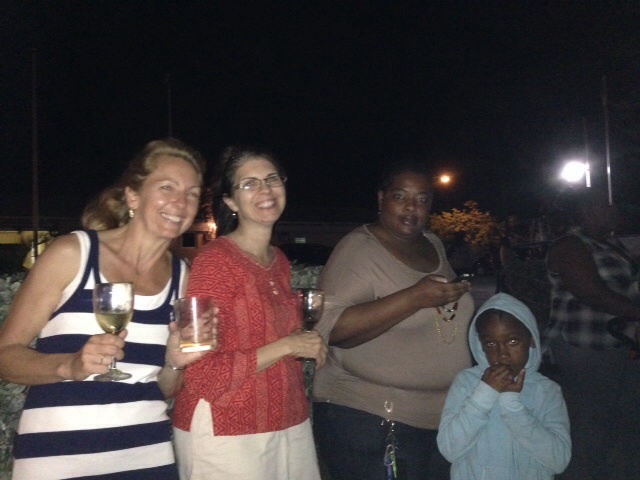 Hanging with our new friend Nancy at the New Year’s Eve cruisers pot luck. 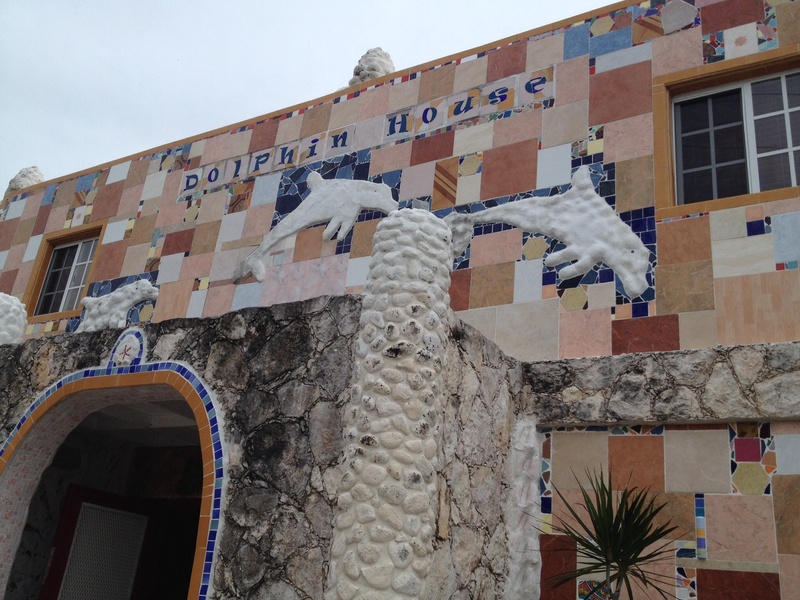 The Dolphin House is a beautiful building and museum owned, operated and decorated by an artist who has used scraps from the sea and other sources to make mosaics of every inch inside and out. Ashley is the artist and visionary behind the Dolphin house. He gave Nancy and I a tremendous tour! 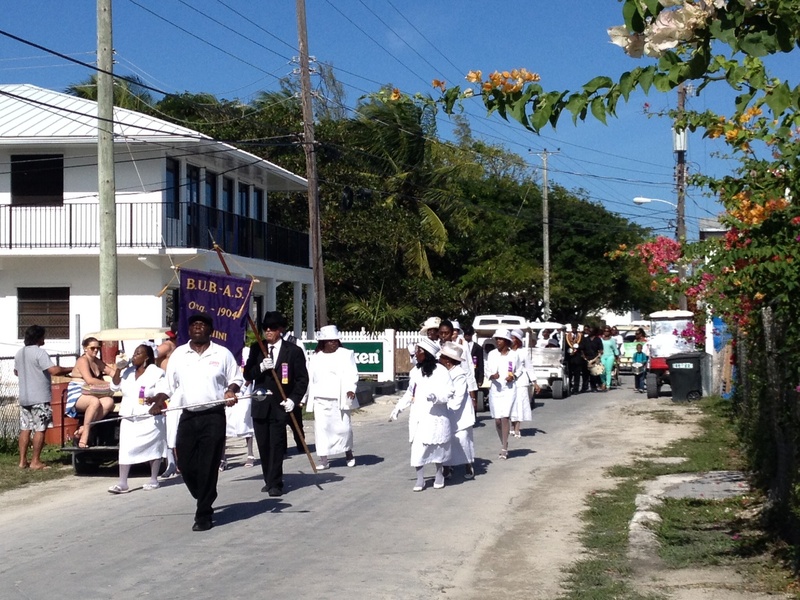 This was the after church New Year’s parade with the community band. 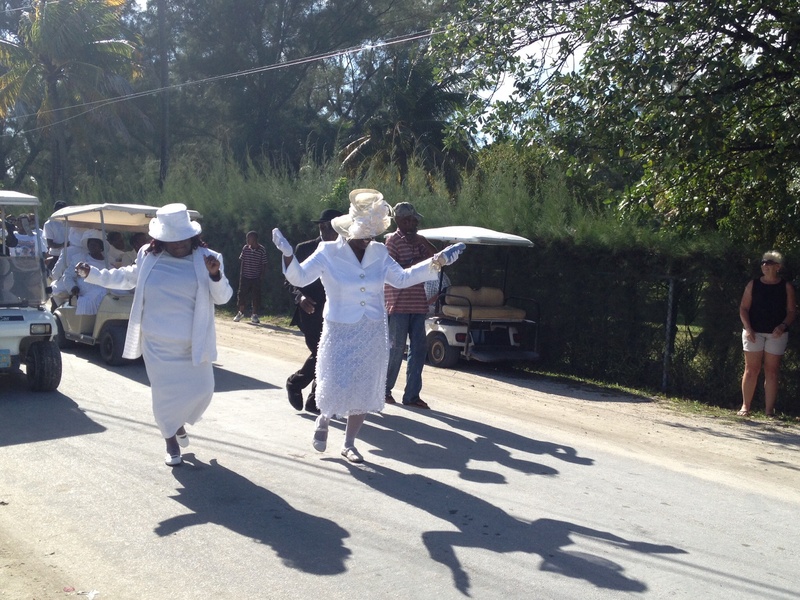 The women looked beautiful in their all white outfits! I like any place where there is so much dancing in the streets!! Frank’s looking pretty pleased with life! Annette and I at the Junkanoo parade! Dancing in the streets! I had a cute little dancing partner. We are all waiting for the next weather window to make our next trip over to Nassau. The “forced” down time has been just perfect. The weather has alternated between hot and humid to gray and breezy and everywhere in between . . . but it has all been beautiful (especially looking at pictures of snow back home this morning!) 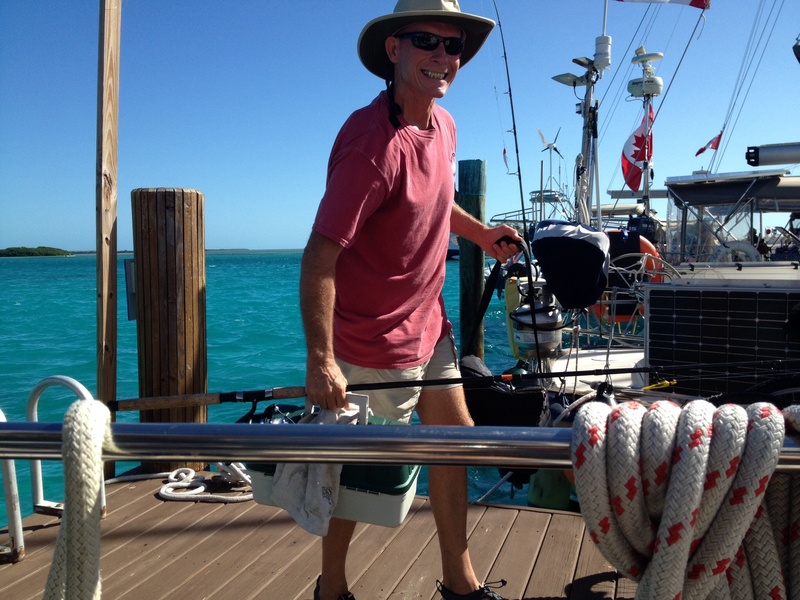 While sitting in a lounge chair overlooking the marina the other afternoon, Frank looked as content as I’ve seen him look in a while and said, “Now THIS is what I signed up for.” We have started a whole new, amazing phase to our cruising.